Tearle Family history in Stanbridge, Bedfordshire. John Tearle was a Lt Commander in the Royal Navy during the Second World War. He was awarded the Atlantic Star and the Africa Star. He had served on the DEVONSHIRE and the MANCHESTER. He was awarded five medals in all, which he wore on a bar during formal military occasions. One was the War Medal 1939-1945 awarded to all personnel who had completed at least 28 days service between 3 Sep 1939 and 2 Sep 1945; then the 1939-1945 Star which was awarded for operational service between 3 Sep 1939 and 2 Sep 1945, and John certainly had plenty of that. 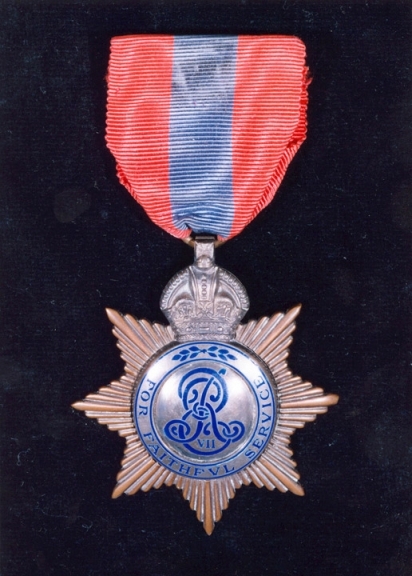 Another was the Africa Star, the fourth was the Atlantic Star, and the fifth was the Defence Medal. Servicemen were only allowed five medals for fighting in World War 2, and John had a full house. He would have won the Africa Star because he had served on the HMS Manchester in the Mediterranean, and the Atlantic Star because the Manchester had also served in the Atlantic convoys, joined the search for the Bismark, and she had also been engaged in the reinforcement of Spitzbergen. She had a very sad end when she was hit by a torpedo dropped from an enemy aeroplane on 13 August 1942, and was severely damaged off the coast of Tunisia. Her captain decided she was unable to make it back to port, so to save his men, he ordered the ship scuttled. He was court-marshalled, found guilty of negligence, and dismissed from service. It is likely that John’s children would be very grateful for the captain’s gesture. It is not clear when John Tearle served on the HMS Devonshire because she was never sunk, and since she was built in 1926 and scrapped in 1954, he could have served on her at any time, and for any length of time. She is famous for rescuing the Norwegian royal family in 1940, for which they still supply a beautiful Norwegian fir every Christmas to stand, emblazoned with white lights, in Trafalgar Square. In a book by the author entitled William A J Tearle, Firefighter of Lostwithiel, there is recounted the story of Victor Tearle, who served on the Onslow, and escorted the Norwegian royal family back to Norway at the end of the war. The Devonshire was the flagship of that convoy. She also served in the Eastern Fleet in the Indian Ocean escorting ANZAC forces from Suez to Australia. He had a brother and two sisters, known familiarly to the family as Uncle Frank, Aunt Kitty (married to Robert) and Aunt Betsy, married to Angus. 30 May 1958 he arrives in Southampton from Bombay on the Carthage. This is because he was the chief engineer at Singareni Coal Mines, not far from Hyderabad. His wife, Jean Tearle, had also made the trip to and from Bombay many times, often accompanied by one or more of her children, some of whom had been born in India. Auntie Betsy was Violet Elizabeth. Thomas Tearle 1709 and Mary nee Sibley. From the point of view of John’s grandchildren, they are looking at nine generations of their family’s history. It is now time to put some detail into the events that led to the construction of the family tree immediately above. Born: Aldershot, Hants. It is not clear why he said this, because his birth registration clearly states he was born in Bisham, Berkshire. Employer: Messrs Medmenham Pottery Co, Marlow, Buckinghamshire, for which company he was a clerk. The second page tells us he was 5ft 8¼ in tall with scars on his left knee. A medical examination pronounced him fit for army service on 25 November 1896. Length of service: 25.11.96 to 5.12.96. 11 days. Purchased. This would suggest he had not liked the army and, since he was only 18, it is safe to assume his father had paid the fee. His father, it turns out, is a very interesting man indeed, with a biblical name that many of us would love to carry even today. Enoch Tearle was born in Stanbridge, Bedfordshire, on 21 June 1841, the year of the ground-breaking census exercise that has taken a snapshot of British life every ten years since, with breaks in the war years. Abel, Amos, Enoch, Levi and Noah are some of the beautiful names liberally sprinkled amongst the Tearle families, matched by equally beautiful and historic names given to girls: Abigail, Ruth, Catherine, Charlotte, Martha and Phoebe to name just a few. The Victorians loved the Gothic as you can see from their churches and public buildings and even in the decorations on their more expensive houses. Gothic was part of the language of their belief in God, and so their children’s names reflected this spirit of their deep-seated Christian beliefs. What better way to express your devotion, than to give your children the names of His favourite sons and daughters? From Bisham in Berkshire to Stanbridge in Bedfordshire we have, in one bound, leapt into the heartland of the Tearles. It is in this village, and in the little valley where Stanbridge nestles, that the Tearles have lived, worked, loved and died for at least five hundred years. The Tearles call it Tearle Valley, and the wider district is known as Tearle Country. The map of Stanbridge helps to delineate the boundaries: the village lies at the head of a valley aligned roughly north-west to south-east, with Stanbridge at the head. Even Eggington is not within Tearle Valley. There are limestone cliffs to the south-west. This limestone has been extracted for building blocks from time immemorial. It was called Totternhoe Stone and it was soft and carveable, but hardened nicely over time – perfect for lining the walls inside, for instance, St Albans Abbey, now St Albans Cathedral. Along the base of the upland runs the A4145 from Leighton Buzzard to Hemel Hempstead. On this road is Northall. An arch drawn from Northall across the north of Stanbridge to the A5 will describe the top of Tearle Valley. Following the A5 (Watling Street) to the junction of the Icknield Way – which, since ancient times, has followed the dry route along the tops of the hills through this part of Bedfordshire – will lead to the junction of the A4146, and everything inside is Tearle Valley, the ancestral home of most of the Tearles alive today. Inside the valley are Totternhoe, Eaton Bray and Edlesborough. Within ten miles are the country towns of Leighton Buzzard, Luton and Dunstable. These towns are in the wider area known as Tearle Country, and there are more Tearles in this small area of Bedfordshire than anywhere else in the world. It turns out that the Tearles are a Bedfordshire, and indeed a Stanbridge family of rural folk who have worked the land as tenant farmers, and occasionally land owners, until the last Tearle who lived in Stanbridge died in a cottage on Peddars Lane in 1956. And Enoch? He was the very model of a Victorian villager. His sister Ann was a strawplaiter who died young at just 47. She never left home and never married. His sister Sarah married a fellow villager, Ephraim Gates and went to Watford. Ephraim secured a job on the railways, but very sadly was killed walking along the line in the fog of an early Monday morning, in October 1872. It must have been desperately difficult for Sarah, a washerwoman, to care for her children after Ephraim’s death. His brother Amos moved to Walsall in Warwickshire, as a mining engineer. He married there and in the 1911 census he was a retired engine driver. His sister Phoebe was married in the beautiful little Stanbridge church in 1863 and also moved to Warwickshire where she registered the birth of three children in Nuneaton, only 20 miles away.. His sister Mary Clarke Tearle was baptised a Methodist in a tiny brick chapel next to what is now the Stanbridge school. The chapel no longer stands. Enoch’s youngest brother was Benjamin. He, too was baptised a Methodist. He was in the Royal Artillery (Southern) discharged on 15 February 1883. 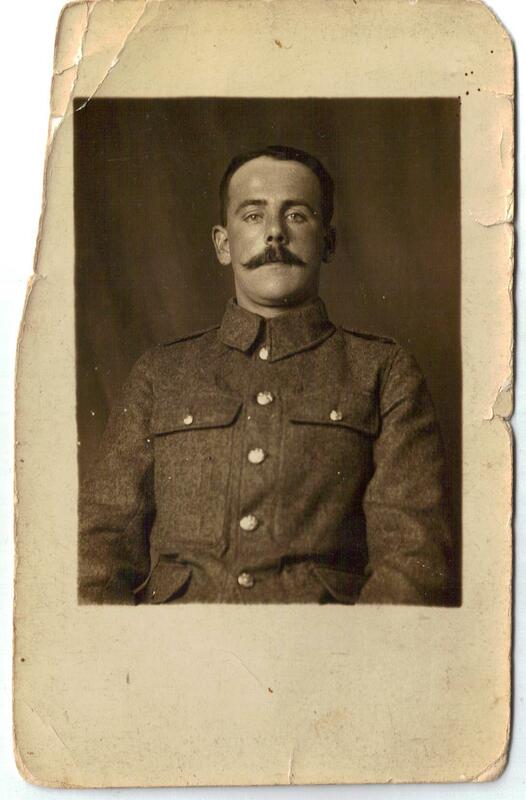 His regimental number was 23882, he was a gunner (ie a private) discharged at the end of his 1st period of service. He had accumulated no service towards his pension. This would appear to mean that either he was on a limited engagement, or that he had not served abroad. In the 1891 Stanbridge census, he was an agricultural labourer living with Alfred and Annie Buckingham. He died in 1900, never married. When you look at these little vignettes of Enoch’s family from 1841 to 1900, it is possible to see the impact of waves of change that transformed the Victorian years. The eldest girl shows the farm-based life of the Bedfordshire village. Strawplaiting was not well paid and a plaiter had to make a length of about 6 yards a day. From time to time a plait dealer would sell the families bails of straw and then collect the plaited lengths and pay the family for them, by the 6-yard length. There is an excellent little display on this craft in the St Albans Museum near the centre of the city, and a very extensive and fascinating display of the strawplaiter’s art in the Wardtown Museum in Luton. It is an enlightening experience to see both the complexity of the task, and the simplicity of the cottage that housed it. The lengths of plait would be turned into straw hats, and whilst Bedfordshire is no longer the hat-making capital of the world, Luton even today has businesses that make the very best hats for people who are about to attend the most prestigious events, such as the horseracing at Royal Ascot. Children as young as five were working at plaitmaking – as long as their fingers could perform the motions, they were at work. It sounds terrible, and it probably was, but to the girls concerned, it gave them a freedom that few other women in England enjoyed – because they had their own money. This means that they could stay out of service. It meant they did not have to find a poorly-paid, and sometimes very difficult job, in someone else’s house performing menial tasks for long hours, and being constantly at the call of anyone their senior. Not having to be in service was an ambition very few people in Britain could hope to attain. In this respect, the Bedfordshire girls were lucky. Over the one hundred years from 1841 to 1941, life in Britain changed beyond recognition, and Enoch and his family felt the full force of those irresistible changes. The major element of change for the Tearles was education. Methodism introduced free education for country children that had never been available before, and literacy allowed poor families such as the Tearles to take advantage of the other huge change that occurred in the 1840s – the railways. In about 1838 a line was laid from Leighton Buzzard to Euston Station via Dunstable – and suddenly London was only forty miles away; you could save up a fare and take a third class carriage all the way to London, and be there in a day. Elsewhere in tearle.org.uk I have discussed the Willesden Cell, a group of villagers living in London who traveled to and from Stanbridge. They lived in railway cottages and earned railway wages. Nothing could be further from the rural life than that. Their education, no matter how basic, equipped them to work in urban occupations and the railways supplied the means to travel there, and even the occupations in which to work. And that life banished crop failures and starvation for those families forever. In the midst of all this change, what did Enoch do? The best way to explore his life is through the censuses because without too much difficulty they can be download from ancestry.co.uk and the source documents can be examined. In 1841, his father Abel and mother Martha were living in a cottage in Stanbridge with Ann, Sarah and Amos, as well as his mother’s younger brother. Enoch’s father was an ag lab. This is a Victorian catch-all phrase for anyone, no matter how skilled, whose fundamental means of survival was working for a farmer. The census was usually around April, so Enoch does not appear here, but he is not far off. In 1851, there is a picture of unchanging, stable rural life, as glimpsed through the kitchen window. Martha is an ag lab wife, Ann and Sarah are strawplaiters, Amos (11yrs) and Enoch (9yrs) are scholars (they are at school) and Phoebe, Mary, Benjamin and Elizabeth probably have the run of the village green. It is almost certain that Amos and Enoch were educated at a school in Stanbridge because in 1842 the Primitive Methodist congregation bought a thirty foot plot of land for £5 and built a chapel and school. It was a fervent belief of the Methodists that the individual needed to read the Bible. They had to know for themselves what the scriptures said, so they could fully understand God’s Word. In many English villages, if there is a Methodist chapel, it would have doubled for a couple of classrooms and it would have preceded a state-run school by several decades. In 1861, Abel was a platelayer on the railway. No longer a mere ag lab, Abel was employed in permanent work. Platelayers, as the name suggests, built the railway track. For all that, it can’t have paid a huge amount of money because Martha, Ann, Phoebe and Mary were all still plaitmaking, while Benjamin and Elizabeth were attending to their studies at school. However, Enoch and Amos are not there in Stanbridge. 17th November 1869 at Saint Paul’s Church, Parish of Liverpool, Lancaster. Profession: Private 4th King’s own Regiment: Residence: Chester Castle. Residence Shields Court, Castle Street, Chester. It would probably not be a surprise, given her name, that Enoch’s wife, Elizabeth Jones, was Welsh, and since the distance from Liverpool to Chester is not very far, perhaps Enoch and Elizabeth went to the nearest place in Wales from Liverpool while he was on furlough. Elizabeth came from Hope’s Place, Flintshire, which is a village not far from Wrexham. I wonder whose idea it was to have a second marriage ceremony in a Methodist chapel in Wales? It is a charming and romantic gesture. I am fairly certain that the St Pauls in question was the beautiful, classically Georgian building in central Liverpool demolished in 1931, almost inevitably, by the railways, and now the site of the Liverpool Football Club’s Anfield Stadium. From the second marriage document it is clear to see what Enoch has been doing in the previous few years – he joined the army. And he has set a precedent. He has joined the King’s Own Regiment. Its full name is the King’s Own Royal Lancashire Regiment, usually shortened to the Royal Lancs Regt, or The King’s Own. The 4th Division (also known as the 4th Foot) has a home in Aldershot, Hampshire. In 1871, the census people came to visit Enoch, and there is a lot more about his activities. For some reason he was counted twice, and that is most unusual. The first record has Enoch in the Chester Castle Barracks, he is a private in the 4th Foot, and he is from Leighton Buzzard, Bedfordshire. Amongst the soldiers is a drummer from London and other men of the 4th Foot come from Liverpool, Chester, Ireland, Wareham, Northampton and Cambridge. The second 1871 census return is from Bridge St, Chester, where Enoch Tearle, aged 29 lived with Elizabeth Tearle, aged 20. Enoch described himself as private, soldier, 4th King’s Own Regiment, from Stanbridge, Bedfordshire, while Elizabeth was simply dressmaker, from Flintshire. This is not a military street, even though Chester has been a military town since Roman times. Chester Castle itself was built by the Normans and still stands within the city walls. In this street, there are another two dressmakers, a master painter, a stone mason, a butcher, a cashier in a millinery department, a draper’s assistant and a general servant. There is even a pupil teacher, the backbone of the profession in the early history of education in England. All of these are working people, but this neighbourhood is a long way, in kind and in distance, from Enoch’s village. There are no farmers and there are no ag labs. And, interestingly, in this street there are very few children. In 1881, Enoch is much closer to his roots than in bustling, urban, militarised Chester, but the census return still tells a well-traveled tale. Enoch and Elizabeth are living in the village of Bisham, Berkshire, where he is a butler, and Elizabeth is a full-time wife. He says he is only 34 and she is 29. Enoch’s arithmetic is a little out of sync with his age because, since he was born in 1841, he was 40 in 1881. Enoch has left the army and he is working, to make up the gap between his military pension and what he needs to spend to keep his family in the manner he wants. The most senior person in a great house is the cook; the next most senior is the butler; Enoch would be on a good wage. He also has a family: Jeffrey Jones Tearle, Minnie, Emily and Martha Elizabeth. Jeffrey was born in Aldershot, Hampshire, the southern military training camp; Minnie was born in Woolwich, the London barracks; Emily was born in Athlone, Ireland and Martha was born in Aldershot. John Herbert was born in 1881 in Bisham, Berks, so he is not far away when the census enumerator comes knocking. That Emily was born in Ireland means that Enoch did his country’s duty in policing the Irish revolution that began in 1798 and finally ended with Irish independence in 1922. The 1891 census shows Elizabeth living in Great Marlow, Buckinghamshire. Neither Elizabeth nor Minnie, the eldest girl, give an occupation but Emily is a dressmaker and Bessie, John Herbert and Katherine Mary are at school while little Samuel Hugh is just two years old. The range of occupations is expanding in small town life – there is a foreman in a brewery, a locomotive fireman, two millers and a butler in Elizabeth’s street. Enoch was in London for this census, working at 24 Portland Place, not far from the present Broadcasting House and today houses the Associated Board of the Royal School of Music. In 1891 this imposing building was the home of three elderly Yorkshire sisters, all single. They had a household of no less than nine staff, and Enoch was their butler. In 1901, things have changed a little. Enoch’s occupation as the enumerator wrote it is illegible because of a deep black cross over it, drawn by the person who was checking all the different occupations people gave and distilling them into a few codes. So, for instance, ag lab was still in use for a farm worker. Enoch was definitely a worker so he was employed, rather than running his own business. Elizabeth, Katherine and Samuel Hugh do not give an occupation, and at 11yrs old it is certain that Samuel is still at school, but at 15yrs, it is not clear whether Katherine might be still at school, although it cannot be ruled out. The situation, though, looks calm and peaceful. 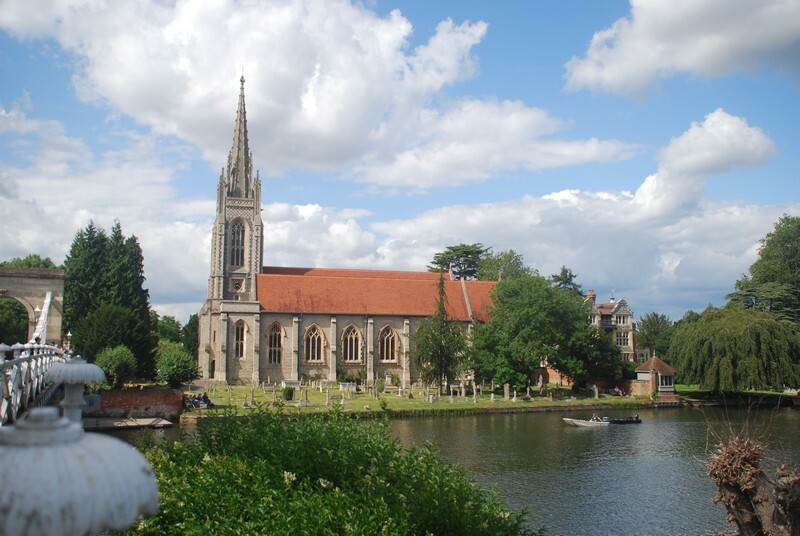 Marlow, Buckinghamshire, is a rural idyll on the banks of the River Thames with large English trees, an imposing spire on a tall and elegant church and a graceful weir down which the Thames tumbles and chortles on its way to London. Enoch has moved back to his comfortable place in rural England. The 1911 census always gives a little more than one would expect from a dry catalogue such as a census. For instance, it notes that Enoch and Elizabeth have been married for 41 years and had a total of nine live births, of whom seven are still living. Enoch is nearly seventy years old, and says he was formerly Army. Katherine is a teacher (assistant), employed by the Buckinghamshire County Council. Enoch says they are living at home in Jubilee Cottage, Newtown, Marlow. 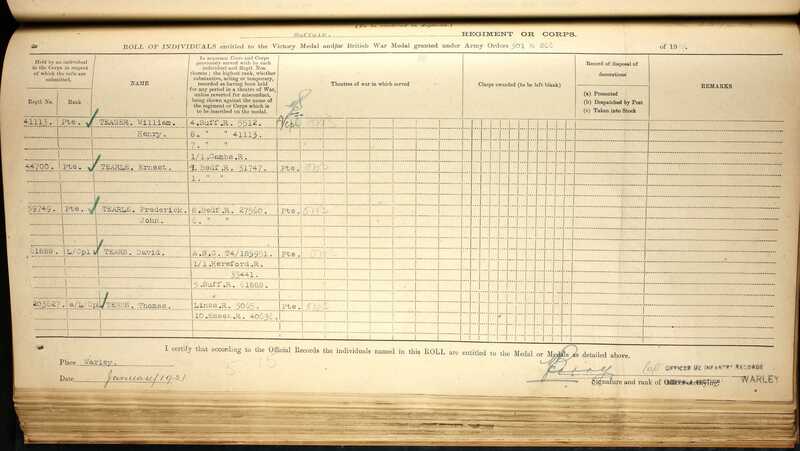 Having found out as much as possible from the censuses taken in Enoch’s lifetime, there are a few details that can be filled in on Enoch’s army record because his discharge papers from the army in 1879 are in the public record. Firstly, they tell us he enlisted at Bedford on 15 November 1858 into the 2nd Battalion, 4th Division, King’s Own Royal Lancashire Regiment, when he was just 18yrs old and worked as a farm labourer. He was 5ft 4in tall, had sandy hair and a slight frame. He had been in service for 21 years and 9 days, which consisted of a first period of 9yrs 145 days then re-enlistment for a further 11yrs 214 days. In that time he had collected a silver medal for long service and good conduct, plus 5 good conduct badges. He was rated as conduct very good, 5B, which would appear to be the best conduct of all, since conduct ratings ranged from fair, then good 1B to 5B, then very good 1B all the way to 5B. In a written note, his conduct is described as very good, habits regular, temperate. The Methodists were keen on temperance, so Enoch was following his up-bringing. His medical record says he was sick four times in Corfu, twice being treated for climate-related conditions, between 1858 and 1863, otherwise he was never injured and never wounded. That is why he was missing in the 1861 census – he was on the island of Corfu, off the coast of Greece. He was actually on service abroad for 9yrs. Also formally noted was that he had never been entered in the regimental defaulters book and he had never been tried by court martial. His formal discharge date was 25 November 1879, he was 39yrs old, of sallow complexion, brown eyes, red hair and his occupation was labourer. His intended place of residence was Captain Yorkes, Bisham Grange, Gt Marlow, Buckinghamshire. At this point two more documents concerning Enoch came to light. One was a listing in the Kelly’s Trades Directory for 1907 which shows Enoch was a shopkeeper in Newtown, Marlow. Presumably, he was trading from this cottage, or at least from a premise very close to it. The last document is the calendar listing for the probate on Enoch’s will. His date of death was 4 March 1920 and the administrator for the £161 worth of his estate, was Bessie Tearle, spinster. “Bessie” was Martha Elizabeth Tearle, born 1877 in Aldershot. 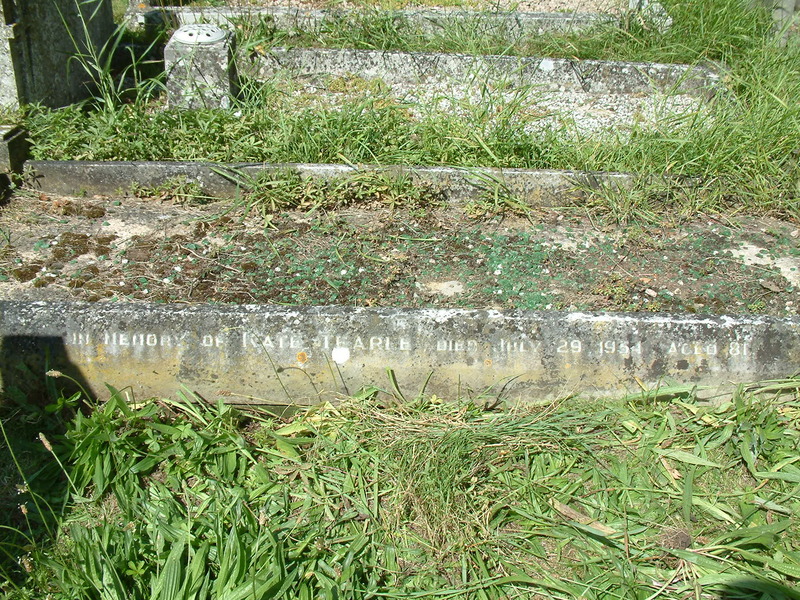 Bessie died, still unmarried, in 1957, in Hastings, on the south coast. The reason for spending so long telling Enoch’s story is because it has ripples and resonance for many of his descendants; to John and even to John’s children. Enoch must have been a larger-than-life, formidable character of a man, because his influence on the future of his family is far-reaching and plain to see. However, for the moment, the story is focussed on where the roots of John Tearle’s Tree are firmly planted. Here is a book that opened in 1821 in a small church in a Bedfordshire village and it is still in use, recording banns for the villagers of Stanbridge who love each other and want to be married. In 2006, at the very first TearleMeet in Stanbridge Enid Horton, and her daughter Lorinda, made it their mission to transcribe all the Tearle events recorded in the register. There were thirty-one entries. The first was 9 September 1825 when John Tearle married Elizabeth Mead, and the last was 21 April 1923 when Ernest Webb married Mabel Edith Tearle. The record held thirty-one marriages in 98 years. Those names are a roll-call of the Tearle family in Stanbridge. On 23 June 1833 Abel Tearle had the first of the three readings of the banns announced for his marriage to Martha Emorton (sic). The vicar has carefully overwritten the e he wrote in Emerton with an o. After much research and checking with modern spellings it was noted that the most common spelling of the name was Emmerton, so that is how it will look from this point forward. We shall skip the 1851 census, partly because Abel is not there, and partly because Enoch is, and we have already looked at his page, above. Martha is described as an ag lab wife. In the 1861 census, things have changed a lot. Abel is a platelayer on the railway. It is likely that Abel missed the 1851 census because he was in a gang laying the plates for the railway somewhere between Preston, Leighton Buzzard and London. In the 1871 census, Abel is 61 and still a railway plate layer, while Ann (25) and Elizabeth (20) are straw plaiters. There are only two ag labs on this page. Things have certainly changed, because James Birch is a railway lab, David Giltrow is a dealer (in plait) John Ellingham is a dealer, and Elizabeth Hinde is a dressmaker. It is interesting to speculate that there might be as many men on the railways as there are left on the land. The Industrial Revolution is well under way. In the 1881 census there is a sad story; Abel is 71 years old and is an agricultural Labourer. He could not retire, he has to keep working. He has gone back to the only other work he knows apart from the railways, and that is the land. It is unlikely he is earning very much, because his daughter Ann is at home helping Martha. Although the enumerator has not given her an occupation, Ann’s straw plaiting would still be bringing in money that the whole house depended on. Abel died on 9 October 1882 and was buried on the 13th. 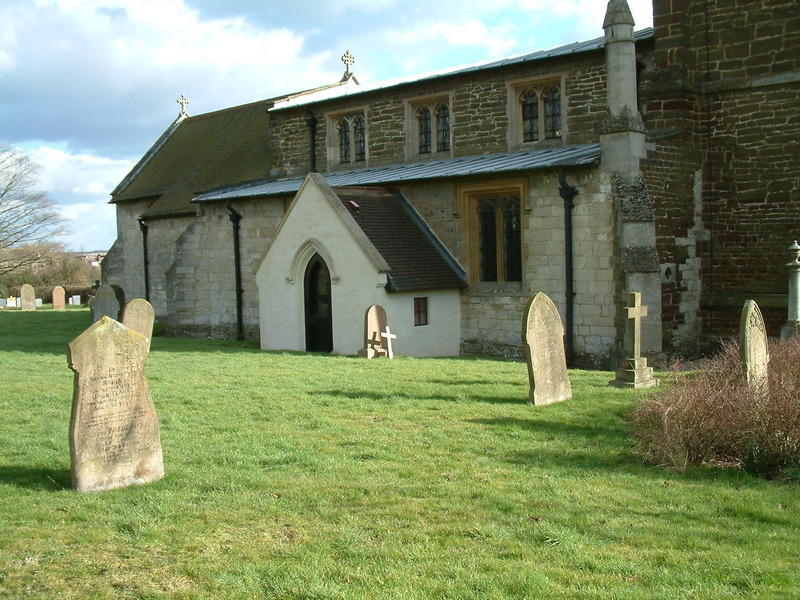 Very sadly, the Leighton Buzzard Parish records also record that Sarah Tearle died and was buried in the little cemetery that surrounds Stanbridge Church, in 1811, it seems not very long after the birth of her last child, Abel 1810, who was to become Enoch’s father. It seems heartless that Sarah died in Oct 1811, and William remarried in November the following year, but both William and Judith would have benefitted a great deal from this marriage – William would have had a wife to look after the children while he worked, and Judith would have had an income and a respectable home. We cannot criticise them. A close look at the 1841 census form indicates that William was an ag lab, so that is what he would have been all his life. It is not possible to know what sort of work he did, and almost all the men on this page of the Totternhoe Rd were ag lab, but there are some occupations listed: Thomas Buckingham was on parish support and Thomas Gadsden was a plait dealer while Sarah Bunker, Mary Turney and Sarah Corkett were all straw plaiters. You can see clearly how farming life completely dominated the village of Stanbridge until the railways arrived and people began to take advantage of them from the 1850s. With a family such as this and so numerous in grandchildren, it is no wonder that Joseph’s branch is very influential amongst the Tearles. You can see clearly the children who have died because there is another with the same name, later. Joseph and Phoebe were determined to have a Thomas, named after Joseph’s father, and a Phoebe to ensure her name carried forward, too. 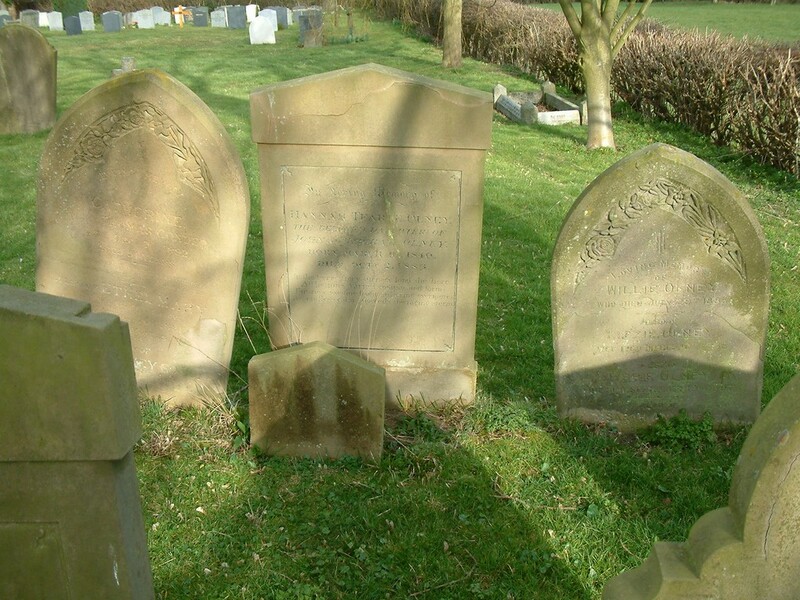 In the case of the twins Phoebe and Thomas Tearle, there is a single burial record for them in 1771 but no baptism, so I am assuming that they died very soon after birth. There was another Thomas baptised 02 January 1774, for whom there is no burial record, but since there is a later Thomas (1780) there is, completely contrived, a death date of 1776. Thomas Tearle, baptised 1780, did survive and married Sarah Gregory in the beautiful little church of Chalgrave, across the A5 to the north-east of Stanbridge, in 1802. Just before leaving Joseph’s Tree, it is well to look at the memorial under the trees in Stanbridge Church to John Tearle (of this family, immediately above) born 1787, who died in 1818. His daughter, Hannah Tearle born 1816, married Henry Fleet, a fellow Methodist in the village, and the two of them went to Sierra Leone on a great Methodist mission and adventure. The two of them fell violently ill on the ship and died within weeks of each other, shortly after arriving in Africa. Their sacrifice for their faith and their idealism is memorialised on a tablet which hung on the wall of the Methodist chapel. It was rescued when the chapel was demolished and it is secured on the wall of Stanbridge Church itself. We have now arrived at one of the roots of the Tearle Tree. Joseph Tearle and Phoebe are William’s parents, so John Tearle 1916, Lt Commander RN, descends from Joseph Tearle of Stanbridge. Although these boys, Joseph and Thomas, were baptised at the same time, they may not have been born at the same time. However, Joseph, because he was the eldest son, inherited a farm which included a piece of Muggington Field, comprising strips of land between Stanbridge and Leighton Buzzard. Without the money to develop and expand his farm, Joseph and Phoebe were forced into ever more desperate circumstances until finally, on the 9th of July 1788, the last piece of land owned by the Tearle family in Stanbridge was sold. Joseph and Phoebe died paupers. A strip of Muggington Field that was bought from Joseph and Phoebe was purchased at the time by the family of Lawrence Cooper, the churchwarden who opened the church on the morning of TearleMeet Two in 2008. 220 years after that sale, Lawrence still owned the land. This Thomas Tearle, the father of Joseph, was born in Stanbridge in 1709 and married Mary Sibley from Houghton Regis on 27 May 1730. They had eight children, of whom seven survived. Thomas died in Leighton Buzzard in 1755 and Mary probably lived with Joseph and Phoebe until her death in 1792. Joseph died in 1790 and Phoebe, who was undoubtedly the leading force for Methodism in the Tearles, died in 1817. An examination of the list of John’s ancestors on page 2 will reveal that all the people on that list have had their stories told, beginning with John Tearle 1916 and Jean nee Searle, and ending with Thomas 1709 and Mary nee Sibley. It is time now to look in a little more detail at the stories of those in John’s family who accepted a role in the military. John Herbert Tearle, John’s father, might have been 33 in 1914, but that did not stop the armed forces from recruiting men of that age, especially if they already had military experience. Between John Herbert and Samuel Hugh was Katherine Mary, born in 1885. A long search attempting to find her in one of the many women’s auxiliary forces, or in a women’s group, was carried out, but there appears to be no documentation. Her contribution has been lost amongst the myriad grains of sand in the great hourglass of events that was the First World War (WW1). Millions of women spent huge amounts of time and energy – and their lives – helping in the war effort and there is no doubt that Katherine Mary joined in that work. Now, however, it is time to start at the top of the list of Enoch and Elizabeth’s children – with Jeffrey. Jeffrey Jones Tearle was born in the Aldershot Camp hospital in 1871, and baptised later the same year. The camp had a hospital, and given that Jeffrey consistently gave his birth address as Aldershot, It is a reasonable assumption that he was born on site, in a vast camp that usually held in excess of 10,000 people. It is difficult to tell if there were married quarters, but Enoch was fully engaged in his army duties, and his family were born wherever he was at the time. The camp had a Methodist chapel, and a Primitive Methodist chapel, so it is very likely that Jeffrey was baptised in one of them, and it is equally likely he went to a school in the camp. Discharged, private, having been found medically unfit for further service. Curragh 9 June ’90 Valve disease of heart. For Discharge. Also, it is clear the army approved of Jeffrey: habits regular, conduct good. On the back of this form, there is a breakdown of where Jeffrey was, and what brought him to the medic’s attention. More importantly, it documents exactly where he was and when he was there. It transpires that the HMS Crocodile was a troopship designed to carry a full battalion of infantry, families and auxiliaries, a total of 1202. On 7 September 1887 she left Portsmouth with Jeffrey on board and on the 9th, Jeffrey was examined by the ship’s doctor. On 5 October 1887 HMS Crocodile arrived in Bombay and the 6th, Jeffrey was again examined by medical staff, this time in the Bombay military hospital. On 17 March 1888 HMS Crocodile left Bombay and on 12 April arrived in Portsmouth. Jeffrey was admitted to the Royal Victoria Military Hospital at Netley, near Southampton, where he stayed for 25 days. A man can get amazingly sick in India. The beauty of this page is that it tells us that a 5ft 4in 18-yr old of only 100lbs is not really British Army fighting material, even if he is only a drummer. Secondly, it spells out in very clear terms where Jeffrey was and when. Thirdly it tells us that Jeffrey was there when the British Raj was at its height – Queen Victoria was proclaimed Empress of India in 1877. What is the disability unfitting him for service? Valve disease of the heart. Its origin, date, progress? Probably constitutional. Started with an attack of rheumatism. Is the disability permanent? Permanent, but he will be able to contribute a little towards ensuring a livelihood. On 7 August 1897, still only 26yrs old, in spite of all his adventures, Jeffrey married Sarah Quarterman in St Ann’s Church, Lambeth, London. He describes himself as a clerk, and his father, Enoch Tearle, as a butler. His sister, Emily Tearle 1876 (the one born in Ireland) was a witness. The 1901 census reveals that Sarah was born in 1867 in Milton under Wychwood, a Cotswold village not far from Chipping Norton. The Gothic parish church of St Simon and St Jude dominates the countryside, which used to be mined for the yellow Milton Stone that was used for many local buildings. They are living at 47 Mayall Rd, Lambeth. It is close to the Brixton Tube station while the Railton Methodist Church is about 100 yards along and one street over. Jeffrey calls himself an O. C. shipping clerk. And they have a son, Reginald Herbert Henry Tearle, just 1yr old. The world has ticked over into the 20th Century, but the Victorians cling on; in this stretch of the road, there are many occupations: a general carman, a keeler groom, a dress wash, road labourer, railway guard, two greengrocers, railway labourer, laundry maid, bath attendant, milliner, shop attendant, and a traveling salesman. Most people here are Londoners, but only four houses are occupied by Brixton-born families. Jeffrey from Aldershot and the traveling salesman from Fyfield, Hants, are the only strangers from out of London. Little Reggie died in1904. In 1911, Jeffrey and Sarah are living in 11 Kepler Rd, Clapham where he is a mercantile clerk for a provision merchant. Provisioning usually applies to the armed forces, in this case, probably the navy. They now have a second son, Edward Jeffrey Tearle aged 4, born in Lambeth. There is also a niece, Beatrice Soden, from Idbury in Oxfordshire. who is their housemaid along with a boarder, perhaps to augment the family income. Beatrice was born in 1882 in Chipping Norton to William Soden and Matilda nee Quarterman. They married in Chipping Norton in 1877. Matilda Quarterman 1856, of Chipping Norton, was Sarah’s sister. Their parents were Israel Quarterman 1822 of Denchworth, Berkshire (an ag lab all his life – the price you pay for living in the country) and Eliza nee Templer (probably Templar) 1822 of Curbridge, Oxfordshire. The last document of Jeffrey’s life was the entry in the probate calendar of 1913. Jeffrey was living in 25 Kepler Road, Clapham. He died on 4 August 1913 at Guy’s Hospital, Surrey and had asked Benjamin Hewitt, a Prudential agent, to administer his estate of £249 14s 7d. Sarah died just over a year later, on 14 December 1914, asking Harriett Brewitt (the wife of Benjamin Brewitt) to administer her estate of £205 17s 4d. There are two marriage records for an Edward J Tearle: one to Margaret Shelley in Essex 1935, and another to Leonora F Wedlake in Somerset in 1941. Until there is documentation to indicate exactly which Edward J is the son of Jeffrey and Sarah nee Quarterman, his story is suspended here. In the not too distant future he would be an engineer and an accountant, so his education had to have been better than a plait school in Bedfordshire. There is no mention of the Wesleyan chapel being used as a school, but I am certain that you cannot rule it out. In 1901, John H and Mary Tearle are living in 107 Brook St, in the parish of St George the Martyr, Southwark. This is a darkly handsome church full of menace and foreboding, on a corner of Borough High Street. It is worth the train fare to London Bridge and a walk through Borough Market just to visit it. Mary is not given an occupation, but John H grandly calls himself accountant, and then reminds the enumerator (in brackets) that really he is only a clerk – oh, and an engineer. The enumerator dismissively encodes him as CC – commercial clerk. Brook St, Southwark (nowadays called Brook Drive) is a very interesting, and a very mixed, street. There are new families from Germany and Ireland, and out-of-towners from Essex, Buckinghamshire, Wheathampstead, Portsmouth and Boughton. There is also a selection of Londoners from all around the city – such as Westminster, Southwark, Lambeth and Newington. The collection of accents you would have heard as you walked in old Brook Street, may have come as quite a surprise, but it does show London growing and diversifying. The occupations are mixed, too, comprised mostly of working class people wanting to move up the aspiration ladder to a better, more stable life. There is a police constable, three teachers, a stone mason, a commercial clerk, a coppersmith’s apprentice, a tailoress, a police sergeant, a home health worker, a bookbinder, a journalist, a housekeeper and a carriage maker. Only one couple is older than 41yrs in the entire street, and that is the 63-yr old bookbinder and his housekeeper wife. As early as 1897, John H was working for the Metropolitan-Vickers Company (M-V). There is a history of the Metropolitan-Vickers Electrical Company Ltd, written by John Dummelow in 1949, and in a chapter entitled BRITISH WESTINGHOUSE from 1899, the first decade: the author describes the events of the first ten years. In 1907, John H is credited with a job of some authority, as both an accountant and an engineer. In 1917, he was assistant secretary and treasurer, and in 1920 (he was called the comptroller) he resigned, after twenty-three years with Westinghouse companies. Westinghouse is an American company, still well known, which made a large range of mostly industrial electrical items – motors for trams and generators for hydro-electric power stations, for instance. The Metropolitan-Vickers Company made products under licence from Westinghouse, firstly (ie before 1910) in Old Broad St, London City. In the 1911 census, the last comprehensive view of John H and his family, he is in Lancaster. His address is Clifton Bank, Church Rd, Urmston. These days, it is just another suburb of Manchester, but possibly, in 1911, it did seem a bit further away than an easy commute, perhaps even a little bit countrified. However, the main reason for living there was to be reasonably close to Trafford Industrial Park, where the M-V company had built a substantial manufacturing plant. John is 30 and Mary is 31, she has been married 10yrs and has had three children, of whom three are still alive. John is an accountant for an electrical manufacturer. They are living in a nine-roomed house – and they have a 13yr-old maid, Ada Mason. In 1916, John Tearle was born in Barton upon Irwell, Lancashire, presumably while they were still living in Urmston, but certainly still close to Trafford Park. He is the man at the centre this narrative. For John H, though, the overall picture, with nine years of his career with Metropolitan-Vickers to go, is one of comparative wealth and some seniority. In 1917, he was listed amongst the senior officials of the company. Although this transcript says the ship was returning from New York, the manifest itself says he was returning from Rio de Janeiro. John Herbert Tearle, 1881, engineer, is not to be confused with J Tearle 1892, engineer, who also traveled, this time on many noted journeys, to and from Buenos Aires and Liverpool. He was John Lawrence Tearle, the father of John L Tearle, scientist and author. The last, short, view we have of John Herbert is a mention in the National Probate Calendar of 1966. Address, 40 Villiers Ave, Surbiton. Died 25 October 1966, probate to Francis John Enoch Tearle, retired company director. £19023. We will see Francis later – we already know he is Uncle Frank – but there is so much more. The sum John Herbert left as his estate is handsome indeed. The last child born to Enoch and Elizabeth Tearle was Samuel Hugh Tearle, born in Marlow, Buckinghamshire, in 1889. When recounting the results of her researches into this family, Mavis Endall of Melbourne, the grand-daughter of Minnie Tearle 1874 (the one born in Woolwich) called him Uncle Sam. The Australians will be part of this story later. Samuel has already appeared in the 1891 census as a baby and in the 1901 census as a schoolboy, where the enumerator’s handwriting made them look like the Harle family. In the 1911 census he is in the army, he is a 21-year old lance corporal from Marlow, Buckinghamshire, and he notes that his father was born in Stanbridge, Bedfordshire. He is on the island of Jersey. Samuel is in a list of soldiers on page 193 of the census, but flipping back one page reveals that he is in the Parish of St Peter’s, and for the name of the head of the family, there is: Officer Commanding 2nd The King’s Own, St Peter’s Barracks, Jersey. Samuel has joined the King’s Own Royal Lancashire Regiment, and he is in the 2nd Battalion, just like Jeffrey. His elder brother, Jeffrey joined the King’s Own in 1886 and here is Samuel, in 1911, already a lance corporal and beginning his career in an outpost. It is not particularly difficult to trace Samuel’s life and adventures in the army, particularly during the Great War. November 1914 Mobilised to be part of 83rd Infantry Brigade, 28th Division, at Winchester. 16 January 1915 Landed at Le Havre, France. 18 September 1918 Battle of Doiran 1918 and advance into Bulgaria. Those who have little knowledge of WW1 will still have heard of some of these battles, because they were the sites of vast bloodshed. Two in particular stand out: Ypres and Loos. The battle of Loos is described in detail by the Western Front Association: www.westernfrontassociation.com but suffice it to say that 75,000 British soldiers were involved, and that it marked the first time that the British army used poison gas. Samuel was involved in all its horrors from trenches on and near the front line. That is where the 2nd Battalion always was. From January 1916, when Samuel landed in Macedonia, until he finally left Turkey, the 2nd Battalion King’s Own Regiment fought the battles that lead to the end of the Ottoman Empire. Chanak on 10 November 1918 refers to the surrender of Constantinople, and Turkey with it. The following day, 11 November 1918, the Germans surrendered. These days we call it Armistice Day. Samuel H and others of the 2nd Battalion, as members of the British Army, marched into Constantinople, to keep the newly-declared peace and to start the process of delivering the war-torn world back to the politicians. 38 Cedar Terrace, Lancaster Gate, W.2. Lancaster Gate is a handsome, stone-faced, multi-storey, 19th Century development in London, part of which borders Hyde Park. It would be informative to see the Service Record for Samuel Hugh but it has never surfaced, and as a result, there is no record of how and when he left the army, but a note in the London Gazette of 10 February 1919 announces he was temporarily made a captain whilst he operated as an adjutant. That is a very good rank indeed, even more so because he rose to it from starting as a mere private. Now we know why he had a London address. Amongst the British expat community, he had found a London girl – and married her. Their first child, a son, was born in Lebong in 1914. They called him Jeffrey Parkhurst Tearle. The records for Samuel and Dorothy are very scarce from this date on, and there is no indication of when, or under what conditions, Samuel left the army. In the London Electoral Roll of 1936 they are in Acton W11, number 39, 2nd Avenue. In 1939, they are in 39 Eastvale, Acton. Both addresses are Acton – North East Ward. On 18 October, 1949, there is a passenger list for the R.M.S ORANTES of the Orient Line for Mr S H Tearle and Mrs Tearle, both 60yrs old, from 15 Vale Court, Aston Vale, London W3. They are sailing to Melbourne, where they intend to stay permanently. In the electoral roll of the State of Victoria, there is a hand-written addition to the Batman, Victoria, roll of Samuel Hugh Tearle. In the 1958 electoral roll of Footscray North, Gellibrand, Victoria, Samuel Hugh is living at 10 Macedon St, W10 where he is a clerk. There are other men, each with their wife, on this page, so I do not know where Dorothy Kate is. The last sight we have of Mavis’ Uncle Sam is the information given to us on his death certificate of 11 May 1961. He was living at 28 Hawson Avenue, Glenhuntly, Victoria, he was 72 years old. He was married in India when he was 24 years old, to Dorothy Kate Parkhurst, and at the time of his death he was still married. He had a son, Jeffrey, who was deceased, and a daughter Geraldine, who was 42 years old. The certificate was signed by D. L. Endall of 7 Wyalong St, Sunshine, Victoria. I do not know exactly who D L Endall was, but we do know the Endalls; Samuel’s elder sister, Minnie, married Joseph Endall in Islington in 1894 and emigrated to Melbourne in 1924. We can now see that Samuel went to Melbourne to live near her. Dorothy Kate was still alive when Samuel died so I am still no wiser as to how the voting rolls have separated them while they were living at the same address, but we do know they were living together. Dorothy Kate died in Murchison, Victoria in 1984. Since Jeffrey Parkhurst Tearle 1914 is Samuel’s son, I will look at his story before moving on to the last of Enoch’s family to have a military career. There is a scarcity of documentation for Jeffrey P that is frankly disappointing. There is a document called Army Returns, Births 1911-1915 which is only an index of the location of the birth records for the babies listed. However, it does indicate that Jeffrey Parkhurst Tearle was born in Lebong in 1914. Grave/Memorial Reference: 12. D. 23. He, too, had followed Enoch into the 2nd Battalion, the King’s Own. He was 27yrs old and he had risen to the rank of sergeant when he died. It is likely that Jeffrey P volunteered to join the army otherwise, of all the units he could have joined, it is very unlikely he would have been conscripted into the 2nd Battalion The King’s Own. The assumption, then, is that he joined up when he turned 18 years old, and that in turn means he had been in the army since 1932. If we have a look at the Actions and Movements section of the King’s Own, we can clearly see that for the first six years of his army life, he was in Britain. In 1938 the entire regiment was shipped to Haifa. This would appear to be in preparation for the Peel Commission plan to partition Palestine. Then World War Two (WW2) broke out. Here is the story, as told by the Kings Own Museum, of what happened in Tobruk and it covers the events of 21 November 1941, the day Sgt Jeffrey Parkhurst Tearle was killed. Briefly, the town of Tobruk was under siege by General Rommel’s forces. A break-out from Tobruk was planned to coincide with an advance from Egypt by the Eighth Army. The attack was launched on 18th November after many days of planning, mine clearance and careful preparation. The fighting was indecisive at first and was in full swing on 20th November when 2nd King’s Own was ordered to attempt to break out. Each section of the battalion was armed with a Bren gun and thirteen Bren magazines; each rifleman carried a hundred rounds in bandoliers and three grenades; in addition each platoon had two Thompson sub-machine guns and one anti-tank rifle. On 21st November as tanks moved forward and broke the silence of the night, A and D Companies were in the front line when a tremendous artillery barrage opened up but most shells fell behind the battalion. As British guns opened fire and the tanks moved forward followed by the carriers so many tanks were disabled by mines that most were knocked out before the infantry were ordered to move. Despite this, D Company moved forward and took their position, ‘Butch’. A Company advanced with C Company in support and found themselves held up by a strong point called ‘Jill’. Whilst D Company was able to hold their position, A and C Companies were forced to withdraw from ‘Jill’ during the afternoon and, with the help of B Company, formed a new defensive position on ‘The Crest’. As a result of this action the battalion took about 300 German prisoners and were able to hold ‘Butch’ until 24th November when they were relieved by 2nd Battalion Leicester Regiment. In the 1911 census, Francis was eight years old, and he had been born in the Regent’s Park district of London to John Herbert Tearle 1881 and Mary nee Ward. He was the elder brother of John 1916. This census demonstrates a growing trend in modern society; large numbers of people do not live in villages or communities any more, they live where their employment takes them, and they make what they can of the community they find themselves in when they get there. If they work for a large company, the company will send them wherever it is necessary for their workforce to be. If they do not wish to move, then their employment is terminated. It was noted earlier that Metropolitan-Vickers had an office, and probably a workshop, in Old Broad St, London, and they also had premises on the corner of Ludgate Hill and Farringdon Rd, in the very heart of London City, but since then they had built a huge manufacturing plant in the Trafford Park industrial zone, Manchester. This is where Francis first appears, living with his family in Church Rd, Urmston. Now, Urmston is only six miles from Manchester city, but Metropolitan-Vickers was still allowed to build a coal-fired manufacturing plant close by. The low-lying nature of the site meant they also had to build a water tower. Instead of it being an eye-sore, it is championed as a wonderful iron structure, of magnificent proportions. Its photograph adorns the wall of their head office. A modern, industrialised Britain cannot now blame the emerging nations for their pollution – it showed the way to modernisation, and that includes pollution on a vast scale, low working-class wages, and mass-migration. John Herbert’s life is a micro-dot of what is to come: born in Bisham, Berkshire, he takes a wife from Surrey, has two children in London and then has Kathleen May in Flixton, Manchester. He is no longer a Berkshire boy, he is an indigenous Englishman, and instead of living with the mores and customs of his boyhood locale, he has to learn what it means to be English, and to live his life within a much more open moral and social compass. In his case, he has his Methodist upbringing to guide him. Whether or not he has brought up his family as Methodists needs to be documented, but he has definitely brought them up with the highest standards of citizenship and morality. Francis John Enoch Tearle 1902 is an example of just how high an ordinary family can aspire, beginning with the illiterate but deeply moral and intensely hard-working Abel Tearle and Martha nee Emmerton. “Tearle, Francis John Enoch, CBE (1965), s of late John Herbert Tearle; b 1902: educ RN Colls Osborne and Dartmouth and Manchester Univ; m 1926, Nettie Liddell, dau of late Matthew A McLean; served 1919-20, midshipman RN and in 1939-45 War as Lt RNVR in Middle East; chartered mechanical engr; gen man Metropolitan Vickers Electric Export Co 1949-54; man dir Associated Electrical Industries (Overseas) Ltd; dir Assocn E.L. Industries Ltd; pres Eutectric Co Ltd; master Worshipful Company of Broderers 1974-75; Travellers’ club and RAC; Shetland Park, Horsley, East Horsley, Surrey”. To deliver courageous leaders with the spirit to fight and win. He was awarded the MBE for his work on the heat treatment of paravane blades. A paravane is made up of a strong steel cable and of two razor-edged blades. The cable is towed alongside a vessel such that the attached blades cut free the moorings of submerged mines. An undated photograph of the mine-sweeping paravanes in production at Metropolitan-Vickers is reproduced on the same page as the photo of John Herbert, so it is possible to see how Professor Smith made Francis’ personal acquaintance, and this in turn tells us that Francis liked to explore the workshop at Trafford. In 1926 he married Nettie Liddell McLean, but there is no trace of this marriage in England or in Scotland. In 1911, Nettie was a seven-year-old in Stretford, near Manchester. The registration district was Barton upon Irwell, the same district that would register the birth of Simon’s father in 1916. Her father, Matthew Adam McLean 1868 was a Scot from Mossend, Lanarkshire, near Motherwell. His occupation was described as Supervisor at an electrical Manufacturer, in other words, Metropolitan-Vickers. He was working at their brand-new plant in Trafford, and living not very far away from the site. At this time, a Ford Model T assembly plant was also built in the same park. Nettie’s mother was Janet Goodlet 1873 from Coatbridge, Lanarkshire, about 10 miles east of Glasgow. She and Matthew married in Glasgow in 1895. There is no indication so far as to who inspired the Liddell surname in Nettie’s name. In 1941, Francis is aboard the CANADA, from Liverpool to Port Said. It is early in WW2 and Rommel has been very successful in battling Allied forces all over North Africa. He became very sick and flew back to Germany to be treated, and to meet with Hitler. The Allies have also found an Enigma machine, and the work in Bletchley Park is uncovering its secrets; Rommel is beginning to lose major battles. Francis says he is living at 95 Moss Lane, Sale, Cheshire, so he has not moved far from Trafford, and describes himself as a civil servant. 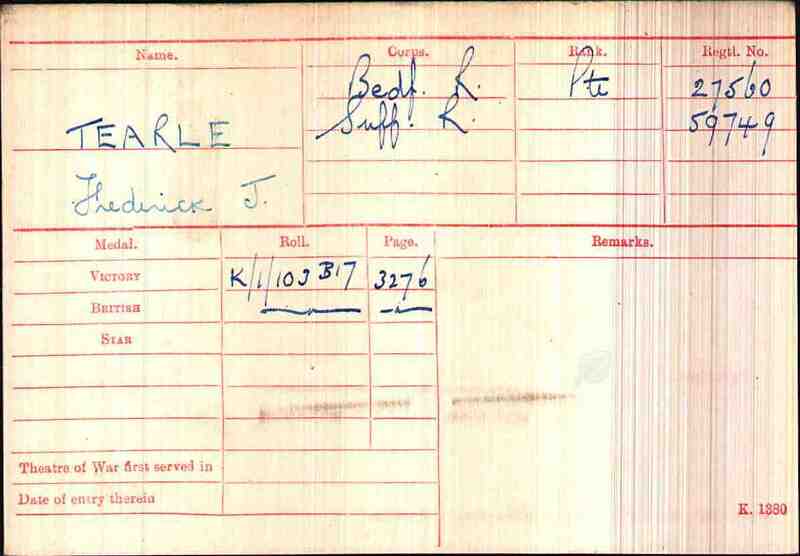 In 1942, he is listed in the royal naval volunteer reserve as (SS) Francis John Enoch Tearle 13 Jan. It is safe to say that his voyage to Egypt in 1941 was on His Majesty’s Service, probably navy business. It can be seen from the very truncated biography above that he was a lieutenant in the RNVR in the Middle East, so it is no surprise to see him in Egypt. There is nothing more about Francis until at the end of 1948 he was appointed managing director of the Metropolitan-Vickers Electrical Export Company Ltd because he had long Russian experience. On page 239 of the M-V history book, there is a photo of Francis, along with a photo of the Johannesburg office, with which, no doubt, he was very familiar. On 9 May 1952, Francis and Nettie are to be seen in a passenger list on the SS ARGENTINA STAR of the Blue Star Line, traveling back to London from Rio de Janeiro. They give their address as Goldrings Rd, Seven Oaks, Surrey. He is a director, Nettie is a housewife, and their country of last permanent residence was Turkey (OHMS). It looks as though Francis’ company has been asked to report on something in Turkey, it has taken more than a year, and now that the work is done, Francis and Nettie are going home. J. F. E. TEARLE, C.B.E., is Managing Director of Associated Electrical Industries Overseas Ltd. In 1964 he led an F.B.I. Mission to Pakistan to study and report on its economic situation, since when A.I.E. have investigated and reported upon the feasibility of manufacturing heavy electrical equipment there. In 1955 Mr Tearle negotiated the Heavy Electrical Project Agreement with Government of India under which A.E.I. Ltd. were appointed Main Consultants. Volume 52, 1965 contained an article written by Francis called “Industrial Development in Pakistan” in which he presented views about the relative merits of encouraging development of East Pakistan at 60% of national expenditure on industrial development and 40% for West Pakistan, mostly because of the “menacing growth of population in the East”. Since then the East has become Bangladesh. Britain confronts the Stalin Revolution: Anglo-Soviet Relations and the Metro-Vickers Crisis. Where have we heard that before? Francis spoke at the trial, but according to Morrell, he was not arrested and he was not imprisoned. He was, however, a very calming and level-headed influence during the entire crisis; the reason the Russians accepted that he was not involved in any sabotage of electrical equipment was because he was a mechanical engineer and not an electrical engineer. The whole affair was highly politically charged and motivated. After the trial, Britain threw up a trade embargo and the two engineers who had been jailed found their sentences commuted to expulsion from the USSR. Anglo-Soviet relations cooled back to whatever was considered normal in the 1930s. We can also note that if Francis was going to Bombay (rather than via Bombay) in 1955, then it is quite likely that the Heavy Electrical Project Agreement signed with the India government was only one of many, and probably the one that he was most satisfied winning. The initials F.B.I. refer to the Federation of British Industry, a fore-runner of today’s CBI. His military background and his engineering skills have seen Francis move in very high circles. We now know that Francis was involved at a very high level with the authorities in Egypt, South Africa, Turkey, Russia, Pakistan and India. However, you can see from the tone of his article that he is a thinking man who expounds a humanist vision. He was also one of the early globe-trotters. He was awarded the CBE for services to export in the New Year’s Honours List, January 1965. He was described as Managing Director, Associated Electrical Industries (Overseas) Ltd. In his conversation on the phone with John L Tearle, Francis made mention of a great-uncle Zepharian. Enoch’s sister, Sarah 1837, married Ephraim Gates who worked for the railways in Watford. It is most likely that this is the man whom Francis and John L were talking about, and he was actually Enoch’s brother-in-law. Wavendon 1940. Probably Commercial Section. 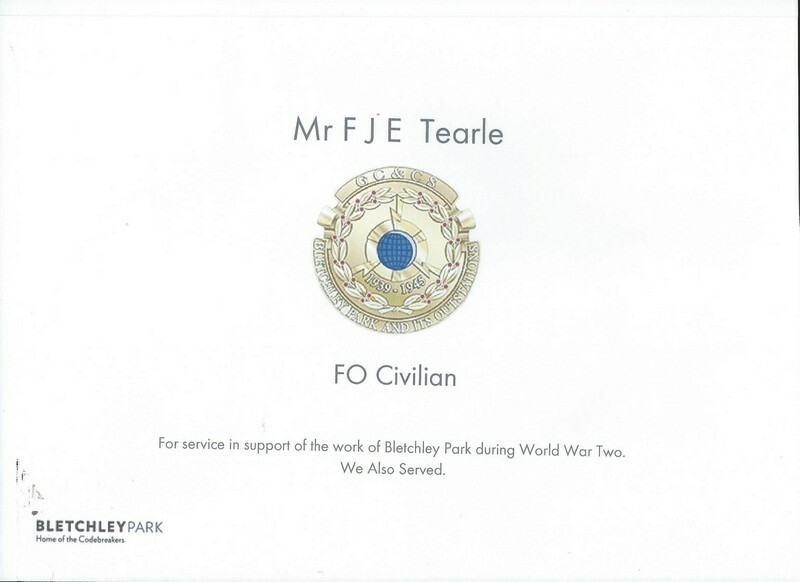 Barbara thought the FO Civilian referred to the Foreign Office, and reinforces the conviction I have that FJE’s trip to Egypt in 1941 as “public servant” was in fact part of his work for Bletchley. Francis died in Macclesfield, Cheshire, in October 1988, so he did not move far from his boyhood haunts of Manchester, just 19 miles to the north. Nettie Liddell Tearle, with whom he seems to have shared many of his adventures, died in 1990, also in Macclesfield. We lost a highly intelligent, well-educated and influential man. In the one hundred years from 1841, when Enoch was born, to 1941, when Francis was involved in kitting out the developing world with heavy electrical equipment, and John Tearle was moving up the rankings in the navy, their family had more than kept pace with a furiously and chaotically accelerating world. The most likely person to be the impetus, and even the inspiration, for it all was Enoch, aided by a determined work ethic from Abel, Enoch’s father, early education from the Methodists, and self-discipline, courage and a circle of very good contacts, thanks to the military. Three generations of Abel’s family are listed here, and there is at least one man in the fourth generation who served in the armed forces, probably the navy. This is a very impressive muster from just one family. They can be proud of their contribution to the history of Britain. Now that we have completed the stories of the military lives, we can take a look at how Enoch (and John Herbert Tearle, no doubt) affected the life of Francis’ extraordinary sister, Aunt Kitty. Whatever the actualities of the one voyage we have for John Herbert Tearle, and his work in Argentina, it is abundantly clear that South America, and Argentina in particular, completely changed the life of Kathleen May Tearle 1910. At this time, Kathleen is single, a stenographer, and along with another female passenger, also a stenographer, she is clearly going to join a company to work. She is seen again, in 1939, on the AVELONA STAR, this time first class. The passenger manifest gives the names; Charles L Whitney aged 32, Fellmonger, of the Cumberland Hotel London W1, on his way to Buenos Aires, Argentina. With him is Kathleen M Tearle De Whitney, aged 28, no occupation, of the same address, going to the same destination. Their last permanent address was in Argentina. The Fellmongers’ Company was originally made up of skinners and glovers and was for long so described, but latterly it became known by its present title. A fellmonger is a dealer in fells or sheepskins, who separates the wool from the pelts. It becomes very clear that they married abroad, and their children were born abroad, because the next sighting of Kathleen is when she and two daughters were recorded on a ship leaving Plymouth for Buenos Aires in 1947. Her address on the ship’s manifest was The Mill House, Denham Bridge nr Yelverton, S. Devon. Since these children will still be alive today, their names are not given here. Three daughters appear to be the full extent of Charles’ and Kathleen’s family. Weddel & Co of Smithfield were meat importers from Australia, New Zealand, South Africa and Argentina in the pioneering days of frozen meat. It was noted in the introduction to this book that Aunt Kitty’s husband was Uncle Bob, which does not preclude his nickname being different from his registered name. There is a birth for Charles Lawrence Whitney in Bradford in 1907 and this name and age certainly fits for the Charles L Whitney, Fellmonger, above. Who knows why and how Charles was called Bob? Perhaps it was a school nickname, perhaps he was always called Bob. We can only conjecture how Kathleen fell for the magic of South America. John Herbert Tearle was in the Argentine in the 1920s. It is safe to say the voyage above was not his only trip to Argentina, so it is quite possible that his contacts enabled him to forward an offer of employment to Kathleen May. One possibility is that she met Charles in London or Buenos Aires, heard the stories of his adventures as a meat buyer for the Smithfield Market and couldn’t resist the romance of travel and adventure that her father John H, and even her grandfather, Enoch, had surely led her to believe. You can see above that she did not desert her family in England, and returned often to make sure her children knew their cousins, aunts and uncles, and their grandparents. The trip to and from Buenos Aires is neither hazard free nor short, so she is braving a huge ocean adventure with every voyage she undertakes. We shall also take a quick look at Violet Elizabeth 1901 and the enigmatic “Uncle Angus”. Violet Elizabeth, the eldest daughter of John Herbert Tearle and Mary nee Ward was born in 1901 in central London, somewhere in the Kensington area, according to the 1911 census. She remains in the shadows, even after she marries Arthur Lancelot Hunking, known universally as Angus. In the 1911 census he is 7yrs old, born in Cam, Gloucestershire, and his father, Arthur Herbert Hunking is 33. He married Eliza Emma Phillips in Dursley, Gloucestershire (Eliza’s home town) in 1901. He says he is a commercial manager, and the company he works for are agricultural implement engineers. Violet married Angus in 1947, somewhere in Paddington, London, but I can find no children for this couple. Also, I was not able to find Angus’ business in Bishop Auckland. There was an industrialist from Up North called Angus Hunking who liked to invest in bands, and once advanced £7000 to King Crimson, but I do not think that he is this Angus. Violet Elizabeth died in Kingston upon Thames in 1965 and Arthur Lancelot Hunking died in Bournemouth in 1976. So unfortunately, this thread has come to an end, but at least we have been able to find the man behind the name; Arthur Lancelot is definitely Uncle Angus. Jeffrey Jones Tearle 1871 was there in 1886, and became very sick. This author can attest to how that feels. Samuel Hugh Tearle 1889 was there in Lebong in 1914 and even married there. He was shipped back to England to be part of Britain’s military efforts in WW1. Samuel Hugh’s son, Jeffrey Parkhurst Tearle was born in Lebong in 1914. He was killed in the defence of Tobruk, Egypt in 1941. Francis John Enoch Tearle 1902 was in and about India for at least five years around 1955, working for the India government on industrial improvements. John Tearle 1916 was an engineer in Hyderabad. Several of John’s children were born in India, and spent much of their formative years there. What has been outlined is a presence in India (although not continuously) of this Tearle family from 1886 until 1988, if the last of John’s children left permanently when they were, say, about 20. That is a snapshot of life to and from India for one hundred years. They have an immense and unparalleled accumulation of experience, unique in the Tearle Tree. Morrell, Gordon W Britain Confronts the Stalin Revolution: Anglo-Soviet Relations and the Metro-Vickers Crisis. Wilfred Laurier University Press 1995. We have already had a look at Edgar’s brother, Frederick John Tearle 1884 of Stanbridge, who came back from WW1, wounded forever. He lived with his family in the house on Peddars Lane and finally died in 1956. Edgar’s story is somewhat different, but it starts the same way. His parents were John Tearle 1861 of Stanbridge and Annie nee Walker. In the 1901 census, the family was living in the second house from the corner of Tilsworth Rd. John was a carter on a farm, and Frederick, the eldest son, was a “cowman” on a farm. The enumerator somewhat dismissively called John an Ag Horse, and Frederick an Ag Cattle, by way of job description. Edgar was seven years younger than Frederick, and at 10yrs old, he was still at school. Alice Agnes at 6yrs and 1yr old Mabel Edith made up the family. In the 1911 census, there are a few changes, and we learn a little more about John and Annie. Firstly, John is now a County Council employee and he is working on the roads. Annie and John are in their late forties and they have had seven children, of which two have died. That may explain the seven-year gap between Frederick and Edgar. And there is one addition to the family, little Eric who is five years old, and he is at school. Three years pass, and in that time cataclysmic forces rise steadily across Europe until finally what was to become the Great War fired the first shots in Sarajevo. The first months were gentle enough, not much different from previous small wars in Europe, and it appeared to many that it would all “be over by Christmas.” Edgar, caught up in the moment, volunteered. This would be quite an adventure, and not to be missed. Here is his entry in National Roll of the Great War. He was unbelievably lucky. He joined the war in the first few months, and was in Europe the following January, with just four months training. Professional soldiers are expensive to train, and expensive to replace. Volunteers, like Edgar and hundreds of thousands who followed him, were used in first-line positions to take the enemy fire and to probe the weak spots. How Edgar survived is a mystery. By the time he was wounded, he was a battle-hardened soldier who had a hastened return to the front line, to help show naive new troops how to fight, and stay alive. 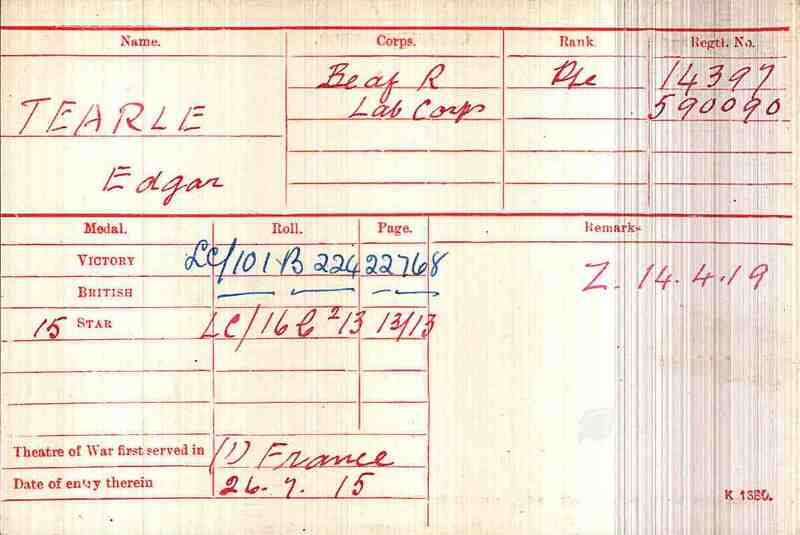 Here is his medals card, showing his service awards, as noted above by National Roll. You can see that he was in the Bedfordshire Regiment, number 14397, but interestingly, he was also in the Labour Corps. This was a huge operation to move supplies and maintain transport links. Here he is, below, in his army uniform: this is a much-loved picture. He was always in danger. The battles he was involved in are legendary for slaughter and the waste of men’s lives. Loos. The Somme. Passchendaele. Cambrai. These battles, even today, are the stuff of nightmares. How he stayed alive is the first mystery; how he kept his sanity is another. But somehow or other, he did both and in 1922 he married Louisa Jane Abraham, in Leighton Buzzard, and they had four children. 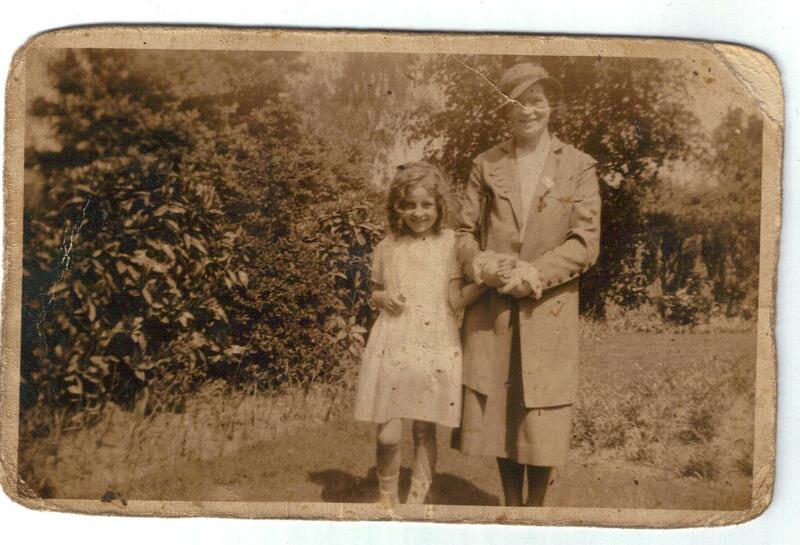 Here is Louisa Jane with her second daughter, Daphne, taken in about 1930. 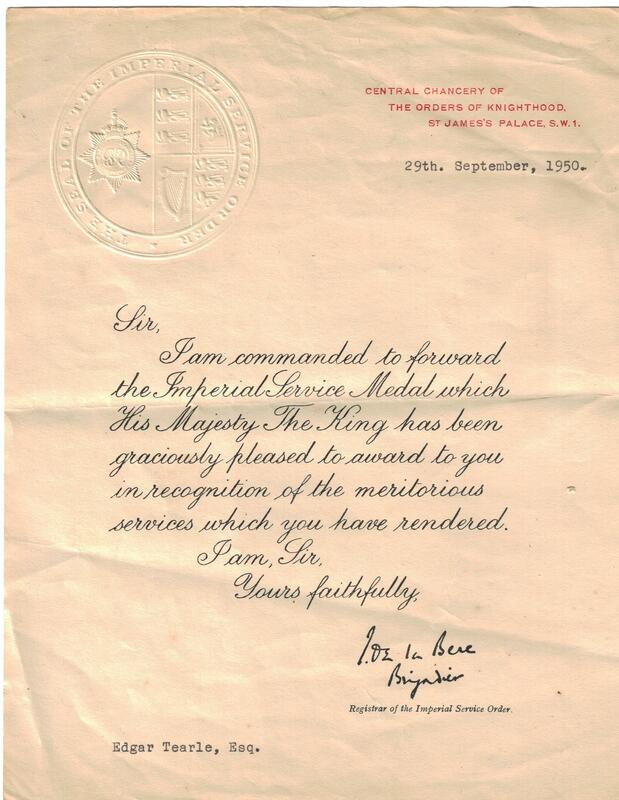 At the end of his working life, Edgar received the Imperial Service Medal, for his work in the Post Office. Edgar was living in a house at 12 Lamas Walk, Leighton Buzzard, when he was struck so sick he was moved to Churchill Hospital in Oxford, where, unfortunately, he died, aged only 60yrs. He was a fine man, and we can be proud that he was one of us. At the end of WW1, a private initiative began that tried to tell the stories of the soldiers of WW1. It was called National Roll of the Great War and while volumes were written, the work could hardly be called comprehensive. However, of the seventeen Tearle men whose stories are in the Roll, one volume does include the stories of two Stanbridge men, who were lucky enough to survive the war. The first is Frederick, and the second is Frederick’s younger brother, Edgar Tearle 1890. This man was Frederick John Tearle, 1884 of Stanbridge, regimental number 27560 Bedfordshire Regiment and 59749 Suffolk Regiment. It is a little odd that National Roll says that Frederick earned the 1914-15 Star, because his service medal record leaves this off. Frederick J Tearle 27560, 59749 WW1 army medal record. Mind you, they do not mention which Theatre of War Frederick joined (France) and when, so perhaps the card is incomplete. Frederick was a son of John Tearle 1862 of Stanbridge and Annie nee Walker. John’s parents were James Tearle 1823 and Hannah nee Philips. James’ parents were Richard and Elizabeth nee Bodsworth, and that means that Frederick was on the branch of John 1741. In the 1901 census Frederick was 17, Edgar was 10yrs old and at school and there were Alice Agnes, 6yr, and Mabel Edith only 1yr. John was a carter on a farm and Frederick was a cowman. The 1911 census, as usual, is a little telling. The form is filled out by Annie, and that reminded me that on their wedding certificate in 1884, John made his mark, but Annie signed her name. It tells us that although in their late 40s, the marriage had already run for 28yrs, that they had 7 live births, but that two had since died. John is a roadman for the County Council, and I think that would be a good step up, and would pay better, and more reliably, than carting farm produce. Frederick (27yrs) was still a farm labourer, and younger brother Edgar, now 20yrs old, was working at a plant nursery. Alice Agnes is 15yrs and still at home. In 1914 the entire land mass of Europe shook with the oncoming rush of war. Britain’s treaties caused her to take sides, and she dived headlong into a disaster on a global scale. Edgar signed up first (it was going to be over by Christmas, remember) in September 1914, and Frederick, who was but a grain of sand on a beach pounded by mighty waves, signed up too. It was March 1915. Three of the battles mentioned in National Roll were vast slaughterhouses over months of war. The gently rolling lands of southern Belgium and Pas-de-Calais in northern France, where the River Somme winds lazily to the sea, were battlefields carved deeply with dugouts, underground headquarters and trenches. Disease was rife supplies ran out, and often the enemy trenches were as close as 100m. In this terrain, men fought for days for no gain, and in that endeavour they died in their tens of thousands. Frederick was unbelievably lucky to survive. It looks as though his injury in the Battle of the Somme was sufficiently serious for him not to be sent back to the battlefield. He was also, I think mostly for administrative reasons, transferred to the 8th Battalion, Suffolk Regiment, which reviewed his documentation and approved the awarding of his service medals. This also explains how he was given two army numbers. He was finally free to go home. But in what condition did he return home? The noise, the carnage, the friends he lost, all of these would have taken an enormous toll on him. In the battle of Cambrai, it was noted that large rats ate the bodies of dead soldiers. That the daily toll of men was about 300, even when the artillery was not firing. And Cambrai, remember, was when tanks were first used on a large scale. The battle of Cambrai was also where Charles Tearle 1894 of Preston was killed, and Ernest John Tearle 1898 (on the same page, above) was gassed. I mention this, because Richard Inns, a Stanbridge villager, told me that Frederick returned to his parents’ house, closed the curtains, and was seldom seen outside the house for the rest of his life. Frederick died in September 1956. So far as I know, Frederick was the last person living in the house; I suspect that the loss of his sister would have hastened his death. When you read the service that Frederick did for his country, and the horrific battles he fought in, there can be no wonder that he could not (or would not) marry on returning to Stanbridge. It is also little wonder that his entire world was reduced to the interior of the last place where he had felt affection and security. Edgar died in Churchill Hospital in Oxford in 1950, but he had been living in Leighton Buzzard until then; I am not certain where Eric was living at the time, but when he died in September 1968, he was the last person born in Stanbridge to carry the Tearle name. A name which had lived in this village since at least 1580, was gone. The parents of almost all the Tearles alive today are a Stanbridge man called Thomas b1710 and his wife, Mary nee Sibley. They had five sons who carried the Tearle name – Joseph b1737, Thomas b1737, John b1741, William b1749 and Richard b1754. There was a Jabez b1745, but he never married and had no children. In order to positively identify any Tearle, I trace them back to one of these men. So where you see the statement, for instance, that John, below is on the branch of John 1741, you will know they are a descendant of John 1741 above. The Tearle Tree is built on this basis and we can trace almost any person who enquires to one of these branches. 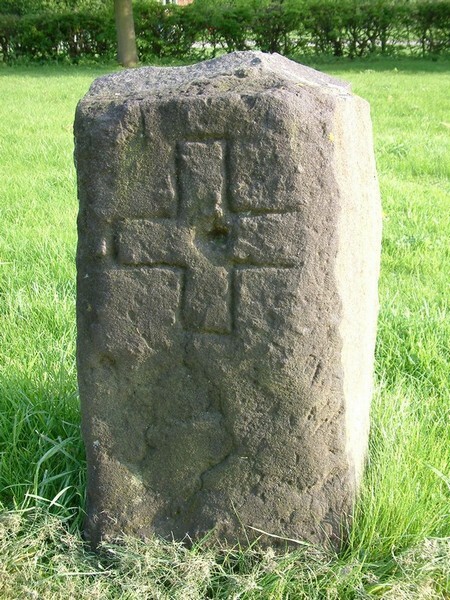 In line with the south entrance of St John the Baptist Church, is a carved stone with a very old cross on it. Although it does not signify occupation in and around it, this stone does server to remind us that Stanbridge has been place of significance since before Roman times. 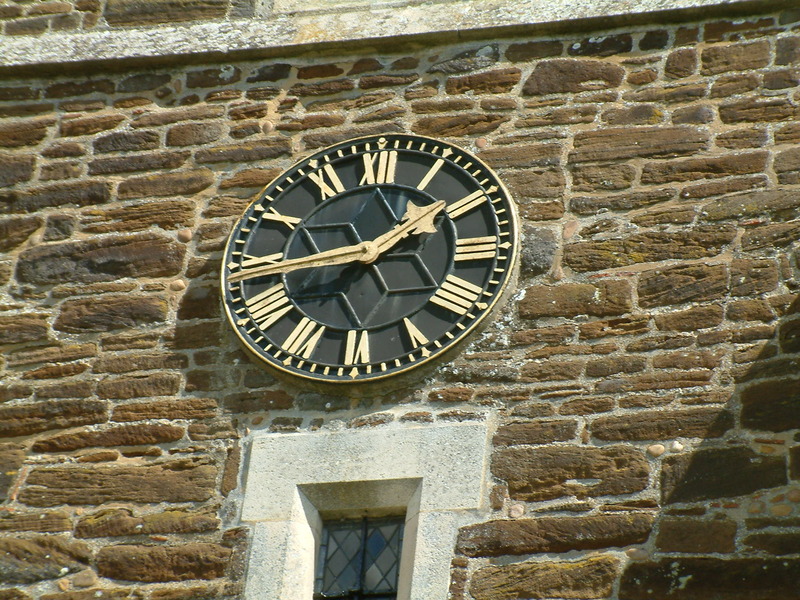 The clock on the church was donated by the villagers who raised money for it to celebrate the end of WW1. It was unveiled by the daughter of Lily Robinson nee Cox. 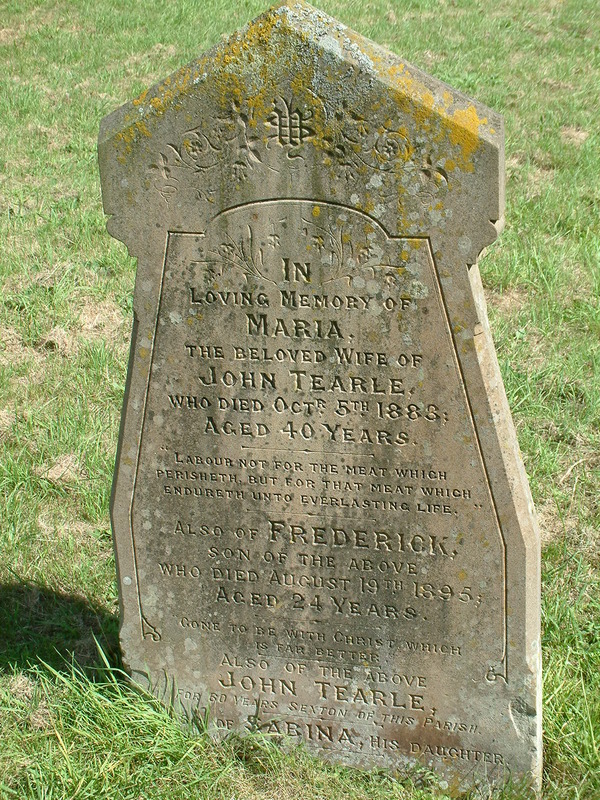 The memorial below is for John Tearle b16 Jan 1840 in Stanbridge; “For sixty years sexton of this parish.” Also on the memorial are other members of John’s family: Maria nee Bliss b1844 in Totternhoe, Frederick b1871 in Stanbridge and Sabina b1875 in Stanbridge. John Tearle was sexton while the Rev Thomas Green was making major upgrades to the fabric of St John’s during the 1890s. He is on the branch of John 1741. The site below is for Eliza Tearle b1873 and Kate Tearle b1873, who died within months of each other in 1954 and are in this grave by the footpath. Kate and Eliza Tearle, Stanbridge. Very close to the foot of the grave above, is the memorial to Phoebe Tearle b 1877 Stanbridge. 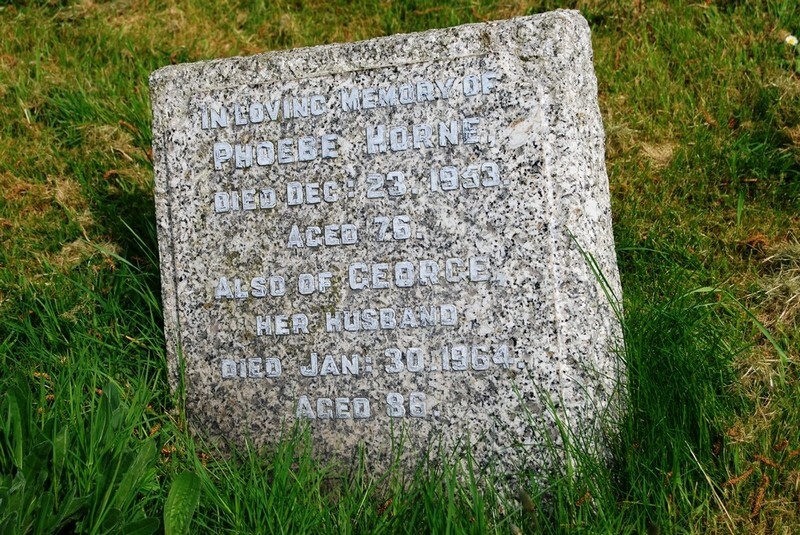 She married George Horne, also of Stanbridge, and they left to seek their fortune in Leeds. Phoebe is one of the daughters of John 1840, the sexton, and Maria. Note how close her memorial is to that of her sisters, Eliza and Kate. I am not certain that she is buried here. 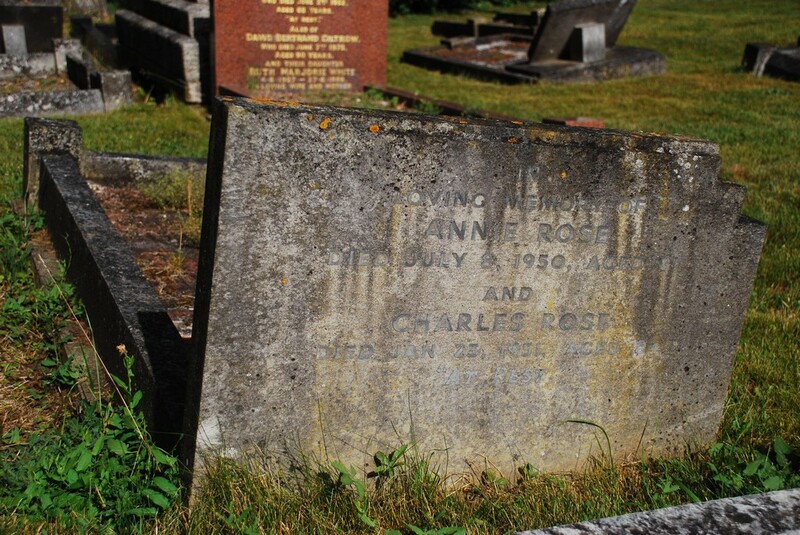 Annie Rose is the sister of Kate and Eliza and thus a daughter of John the sexton. She died in 1950. This little cluster of graves is interesting because others close by may be similarly related. 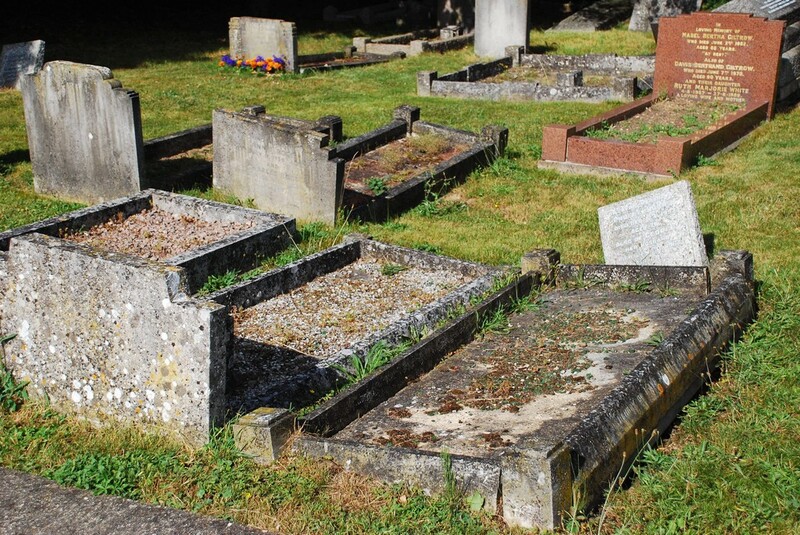 You can see below that the graves of Eliza, Kate, Phoebe and Annie are a close little grouping. Research is continuing to see if other sites nearby are also Tearle graves by another name. 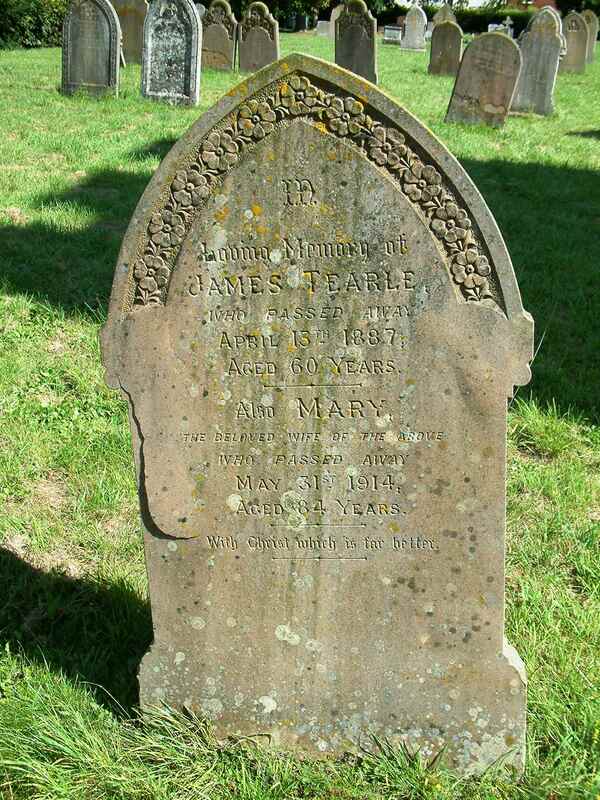 This headstone below is for James Tearle b15 Apr 1827 in Toddington and Mary nee Andrews, b1830 in Eggington. They were married in Stanbridge 26 July 1846. James and John the sexton are brothers. James is my gg-grandfather. While his son Levi went on to become a skilled blacksmith, running a successful business in Wing, James always described himself simply as an agricultural labourer. After his father died, Levi travelled from Wing to see his mother, Mary Tearle nee Andrews, in Stanbridge almost every weekend. James Tearle d1887 and Mary Tearle d1914. James, too, is on the branch of John 1741. The memorials to John and James are close together. It seems likely that the church paid for John’s headstone, while Levi Tearle of Wing, their son, would have paid for James and Mary’s headstone. The memorials to John 1840 and James 1827 are close together. In an odd sort of way, this headstone below for Caroline Shillingworth and Charles is also a Tearle memorial, since in 1888, he married Mary Tearle, the widow of James Tearle, above. When he died in 1891, Mary went to his funeral as Mary Shillingford, widow of Charles and it was as Mary Shillingford that she married William Tearle in the registry office in Watford. This William Tearle was the brother of both James and John above. His first wife was Catharine Fountain, universally known as Kate. Mary died in her son Levi’s house in Wing in 1914 and William died in 1 Grovebury Rd, Leighton Buzzard in 1920. I have never found his burial, but it is in the Stanbridge churchyard. Under the trees, to the south of the church, are the Methodist graves, and some of these are highly significant for us. 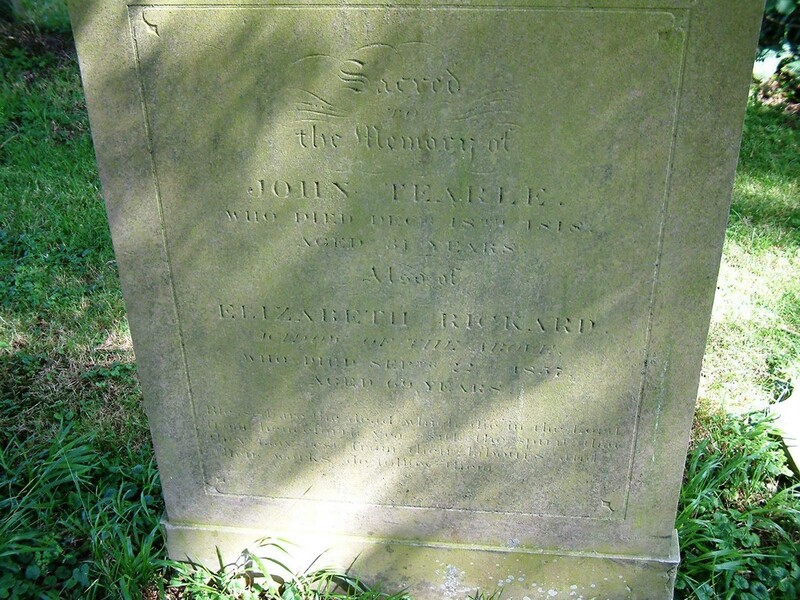 John Tearle d1818 and Elizabeth. John, b1787 in Stanbridge, married Elizabeth Flint of Stanbridge on 4 May 1813. They had three children before he died in 1818, and they certainly made their mark. Elizabeth remarried, to William Rickard, but you will notice his headstone nearby has his name only on it, whilst Elizabeth is written on John’s headstone, but as Elizabeth Rickard. You will see John on the branch of Joseph 1737, because he is a son of Joseph 1737 and Phoebe nee Capp. This is one of the Methodist graves. 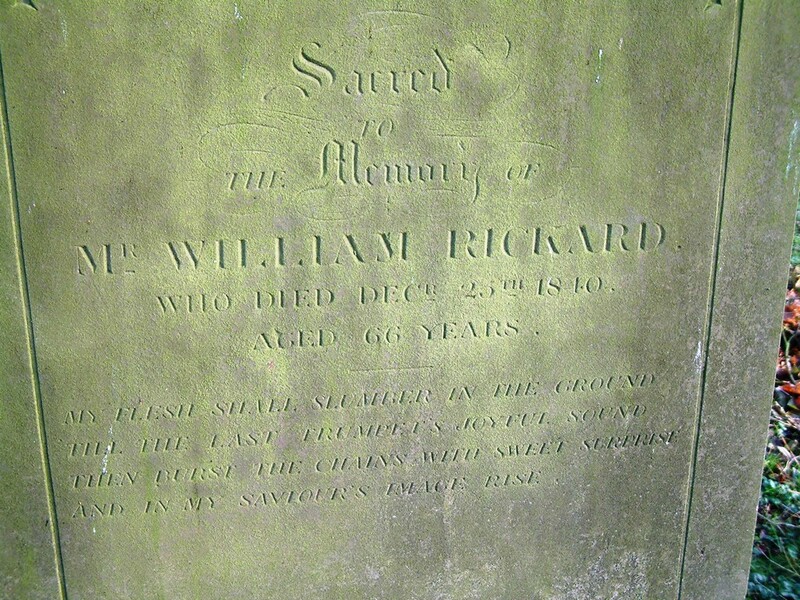 The headstone of William Rickard. 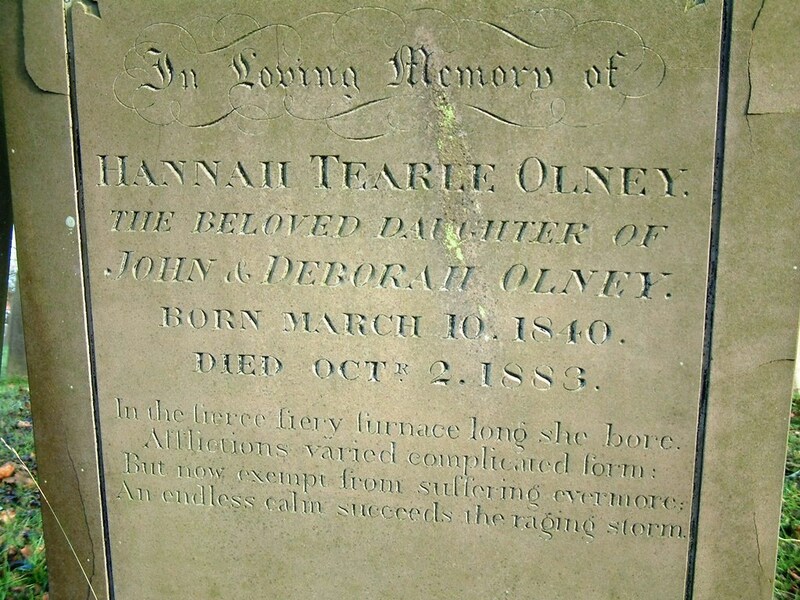 John and Deborah Olney – notice the wonderful age they lived to. He owned and worked a 154 acre farm near Stanbridge, employing 6 labourers. They probably did not live on the farm since their house is in the village near the church. Deborah is a daughter of John 1787 and Elizabeth nee Flint, above. 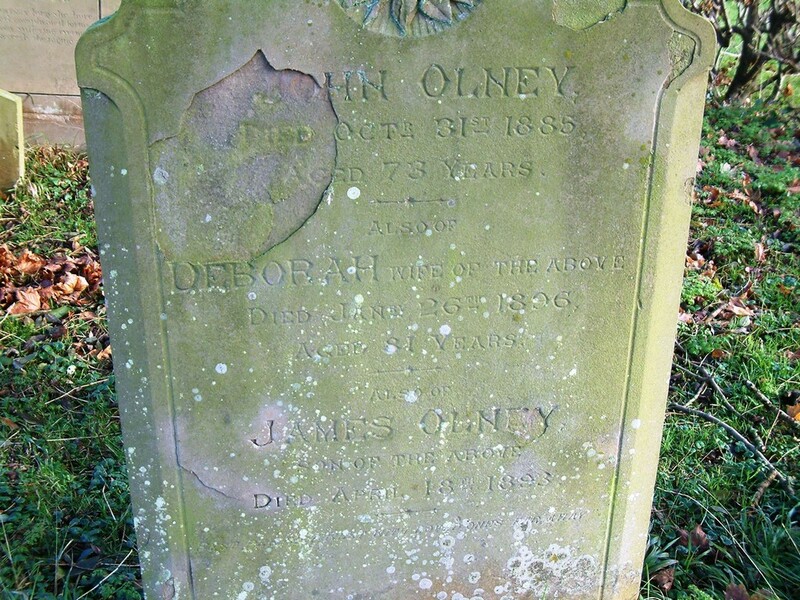 Also on this headstone is their son, James Olney b1837 Stanbridge. Deborah often gives her children the name Tearle as a middle name eg Hannah Tearle Olney – who may have died of cancer. She is named after Deborah’s younger sister. This small headstone is to their four children who died – Thomas and William can be seen written there, but the other two cannot. John and Deborah Olney’s four children. 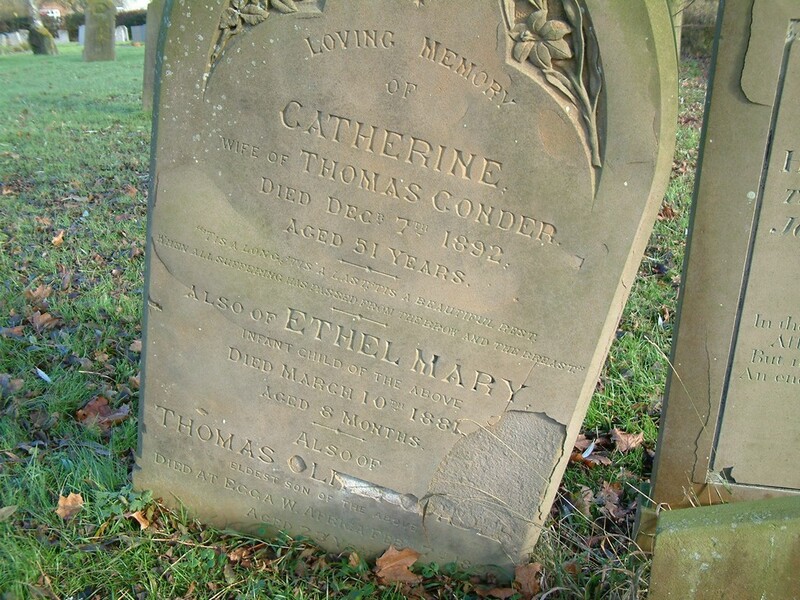 Close to the headstone of John and Deborah Olney is this dark headstone to Catherine Conder who died in 1892. There is also Ethel Mary Conder who died just eight months old in 1891. And tragically recorded is the death of their son Thomas Olney Conder who died in Wega, W Africa, in 1897, in a scene mirroring that of Hannah and Henry Fleet, below, because he, too, was a Methodist missionary. Catherine Conder is Deborah’s fourth child, born 1840 in Stanbridge. Catherine Conder and Thomas Olney Conder, the Methodist missionary. Hannah Tearle b 30 June 1816 and Henry Fleet b1817. They were married in St Johns, Stanbridge in 1838. Their memorial is inside the church and tells the story of their sad and early deaths. Hannah is the second daughter of John 1787 and Elizabeth, above, and was Deborah’s younger sister. The graves under the trees and this memorial to Hannah are of Methodists. There were two Methodist chapels in Stanbridge: the Wesleyan Chapel in Leighton Rd, from which this memorial was transferred to St Johns, and the Primitive Methodist chapel, which was next door to the school on Tilsworth Rd. 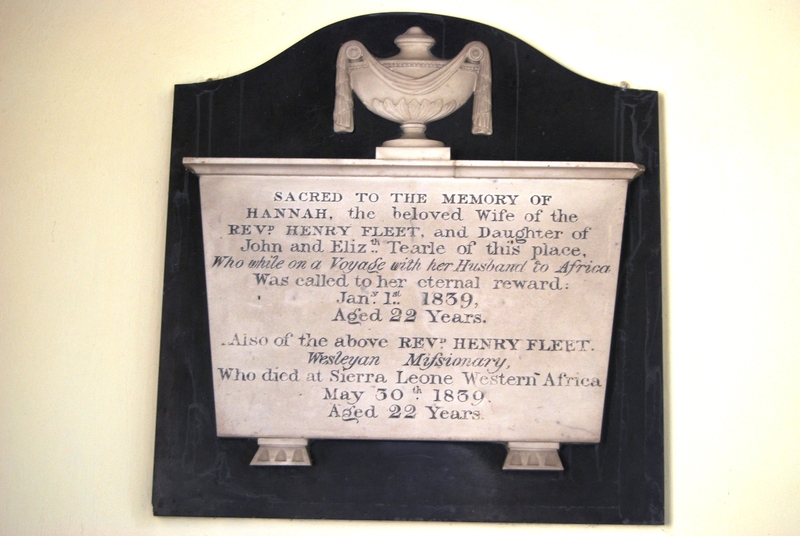 Hannah, the beloved wife of Henry Fleet and daughter of John and Elizabeth Tearle of this parish, who while on a voyage with her husband to Africa, was called to her eternal reward. Jan 1, 1839, aged 22 years. Also of the above Henry Fleet, Wesleyan Missionary, who died at Sierra Leone, Western Africa, May 30 1839, aged 22 years. Hannah Tearle and Henry Fleet memorial. An English custom worthy of note to the family historian; in England, it is the venue that is licensed to perform marriages. Since neither of the Methodist chapel had such a licence, marriages were performed in the Parish Church, in this case, St Johns. Likewise, burials could take place only in the St Johns churchyard; hence the Methodist marriages and the Methodist graves in a Church of England venue. It is sad to note that Methodist sites, until very recently, were on “unconsecrated ground” and the Parish Church did not have the the responsibility of their maintenance. Another interesting thing about the Methodists is that according to “The Citizen”of Leighton Buzzard, 26 Feb 2004, “The village’s first school was opened in June 1876 at the Primitive (Methodist) chapel. It catered for 80 children but was soon full and so a new school was built next door in 1881.” I have often noticed in my wanderings around England that Methodist schools attached to, or run inside Methodist chapels often precede parish schools. The Methodists believed in reading the Bible, so of course you had to be able to read. Look up the story of the Tolepuddle martyrs. Methodism was for the poor, and the modern trade unions are the direct descendants of the early Methodists. The Tearles were at the very centre of that activity in Stanbridge. Methodist graves under the trees. At the end of WW1, a private initiative began that tried to tell the stories of the soldiers of WW1. It was called National Roll of the Great War and while volumes were written, the work could hardly be called comprehensive. However, it does include the stories of two Stanbridge men, who were lucky enough to survive the war. He volunteered in March 1915, and in the same year was sent to France. During his service on the Western Front he was engaged in the fighting on the Somme, at Arras, Bullecourt and Cambrai, and was wounded on the Somme during the retreat of 1918. He was demobilised in November 1919, and holds the 1914-15 Star, the General Service and Victory Medals. He volunteered in September 1914 and in the following January proceeded overseas. He served on the Western Front and fought at Loos and the Somme, where he was wounded. On recovery he rejoined his Battalion, and was engaged in the fighting at Passchendale, Cambrai and in the Retreat and Advance of 1918. He was demobilised in March 1919, and holds the 1914-15 Star, and the General Service and Victory Medals. These two boys, not surprisingly, were brothers, sons of John 1862 Stbg and Annie nee Walker. The first was Frederick John Tearle, 1884 Stbg regimental number 27560 Bedfordshire Regiment and 59749 Suffolk Regiment, and the other was Edgar Tearle, 1890 Stbg number 14397, Bedfordshire Regiment and 590090 Labour Corps. Edgar married Louisa Jane Abraham in 1922. They had a son Alan Richard T in 1926 and Edgar died on 1 Nov 1950 in the Churchill Hospital, Headington, Oxford, having lived in 12 Lamas Walk, Leighton Buzzard until his transfer to Churchill Hospital. Alice died in April 1956, Frederick died in Sep 1956, and Eric, John and Annie’s youngest son, died in July 1968. As the enumerator walked down Tilsworth Rd, John and Annie were in the 59th house, just inside Pedars Lane. When you read the service these two boys did for their country, and the horrific battles they fought in, there can be no wonder that Frederick could not (or would not) marry on returning to Stanbridge. When Eric died in 1968 he was the last person in Stanbridge to carry the Tearle name. A name which had lived in this village since at least the late 1300s was gone. Collated and annotated by Pat Field, from the Stanbridge parish records. Considering the paucity of Tearle headstones in the Stanbridge burial ground that surrounds St John the Baptist Church, there have been a large number of Tearle burials in the parish. Pat Field has compiled the list below to illuminate the families and their associations and you will notice that the earliest in the list include Phoebe nee Capp, as well as John 1741 and Martha nee Archer, who are at the head of two of the main branches of the Tearle family tree. As this list opens, we can see the people who would have been familiar, as children, and grand-children, with the heads of the Tearle tree. Dau of Richard 1773 and Elizabeth nee Bodsworth. Martha nee Archer wife of John 1741. John 1741, hus of Marther nee Archer. Phoebe nee Capp, wif of Joseph 1737. John 1787, son of Joseph 1737 and Phoebe nee Capp. Hus of Elizabeth nee Flint; see Methodist graves. Son of Thomas 1807 and Mary nee Garner. Dau of John 1799 and Elizabeth nee Mead. Son of John 1770 and and Mary nee Janes. Dau of Thomas 1807 and Mary nee Garner. Son of Richard 1773 and Elizabeth nee Bodsworth. Judith nee Knight 2nd wife of William 1769. William 1769, son of Joseph 1737 and Phoebe nee Capp. Hus of Sarah nee Clarke. John 1770, hus of Mary nee James. Richard 1773, son of John 1741 and Martha nee Archer. Hus of Mary nee Bodsworth. Elizabeth nee Mead, wife of John 1779. Son of Joseph 1823 and Mary nee Turney. John 1799, hus of Elizabeth nee Mead. Eliza nee Irons, wife of John 1823. Thomas 1807, hus of Mary nee Garner. Son of John 1799 and Elizabeth nee Irons. Elizabeth nee Bodsworth, wife of Richard 1773. Mary nee Janes, wife of John 1771. Dau William 1832 and Catherine nee Fountain. Dau John 1823 and Eliza nee Irons. Dau of Abel 1810 and Martha nee Emmerton. Dau Jane 1843, dau Thomas 1816 and Ann nee Jones. Dau Sarah Tearle, dau James 1823 and Mary nee Andrews. Sarah married George Blake in Dec 1877. Mary 1803, dau John 1770 and Mary nee Janes. Son of William 1832 and Catherine nee Fountain. Mary Ann nee Turpin, wife of Richard 1816. John 1823, hus of Eliza nee Irons. Son of John 1840 and Maria nee Bliss. Son of James 1823 and Hannah nee Philips. Bedfordshire, Vol 3b, Page 430. Abel 1810, hus of Martha nee Emmerton. Dau Abel 1810 and Martha nee Emmerton. Unbaptised burial, authorised by bishop. Unknown parents. Maria nee Bliss, wife of John 1840. Joseph 1823, hus of Mary nee Turney. Died in Hemel Hempstead Hospital. James 1827, hus of Mary nee Andrews. Parents unknown. May be Arthur Henry Tearle 1887. Birth cert: 1887, Q3, LB, Beds, 3b, 393. Son of Amos 1861 and Martha nee Timms. Hannah nee Philips wife of James 1823. Catherine nee Fountain, wife of William 1832. Dau of Jane 1844, dau of John 1823 and Eliza nee Irons. Son of John 1840, the sexton, and Maria nee Bliss. Son of John 1861 and Annie nee Walker. James 1823, hus of Hannah nee Philips. 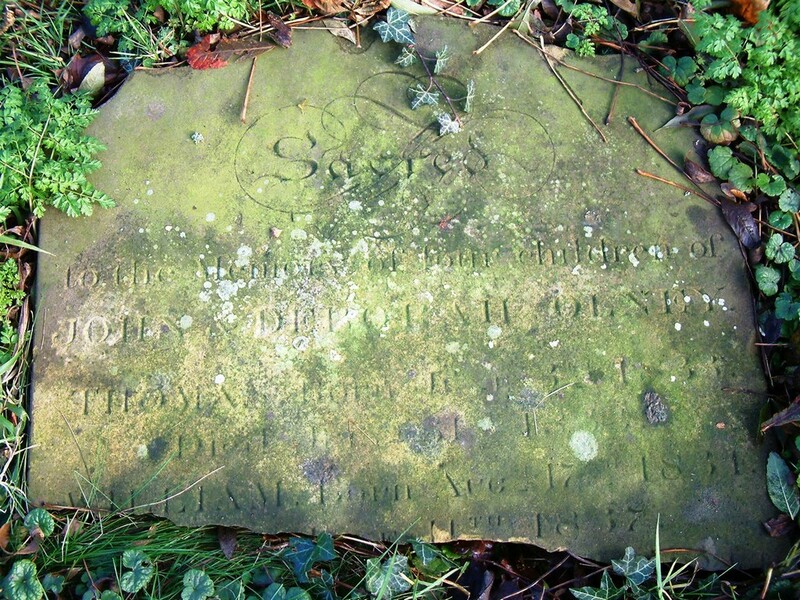 Son of Abel 1810 and Martha nee Emmerton. Elizabeth nee Chapman, wife of Joseph 1823. Dau of John 1823 and Eliza nee Irons. Mary nee Andrews, wife of James 1827. Dau of John 1840, the sexton, and Maria nee Bliss. William 1832, hus of Catherine nee Fountain. Died at 1 Grovebury Rd, Leighton Buzzard. Hus of Maria nee Bliss. John 1861, of Back Lane, Stanbridge. Hus of Annie nee Walker. Annie nee Walker, wife of John 1861. Thomas 1870 son of James 1823 and Hannah nee Philips. Died at 11a Dunstable Rd, Luton. Dau John 1840 and Maria nee Bliss. 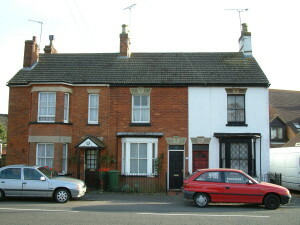 Living at 7 Tilsworth Rd, Stanbridge, died in Kempston. Son of John 1862 and Annie nee Walker. 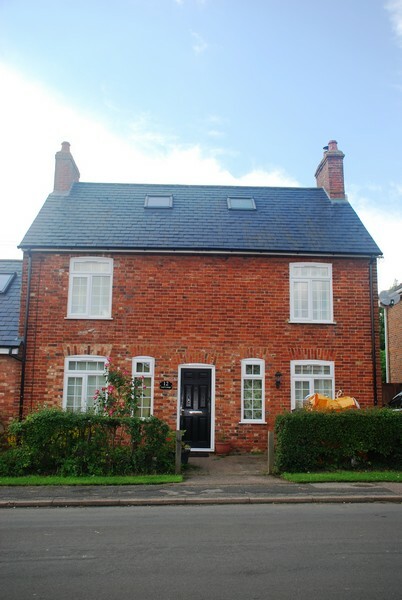 10 Peddars Lane, Stanbridge. WW1 soldier. Dau of John 1862 and Annie nee Walker. I have decided to have a long look at my gg grandmother, Mary nee Andrews of Eggington, a village that is only a short walk from Stanbridge. Cousin Thelma called her “Much Married Mary” although she never told me what that meant. In Mary’s case it is a story of three marriage certificates. Her father is James, aged 40 (b1801) and her mother is Sarah, also aged 40. I have on record that her maiden name was Moore, and I have given 1801 as her birth date given the census return. Mary, then, has a sister, Dinah, 15 (b1826), a brother Abel, 14 (b1827) then Mary, then Sarah, 8 (1833), a brother Thomas 6 (b1835) and little Amos 4m. I have added these children into the Tree. ABEL ANDREWS, b. 1827; d. June 12, 1864. AMOS ANDREWS, b. December 28, 1823, Eggington, Beds; d. January 1, 1837. DINAH ANDREWS, b. June 26, 1825; m. DAVID SCRIVNER. MARY ANDREWS, b. 1830, Eggington, Beds. SARAH ANDREWS, b. 1833, Eggington, Beds; d. March 13, 1861. THOMAS ANDREWS, b. April 16, 1835. WILLIAM ANDREWS, b. June 6, 1820, Eggington, Beds; d. February 17, 1907, Hooper – Weber – Utah. HANNAH ANDREWS, b. 1826, Eggington, Beds. AMOS ANDREWS, b. February 3, 1841, Eggington, Beds. JOHN ANDREWS, b. March 30, 1851; d. April 2, 1851. You’ll also notice that one of this family, William 1820, went off to Utah, after marrying one of the Pantling girls. There were several Pantling families in Eggington. Dinah married David Scrivner, and she was a witness to the marriage of Amos Tearle, my great-grandfather Levi’s brother. Also there was George Blake, who was married to Amos and Levi’s sister, Sarah 1853 Stbg. Both men (Amos and Levi) are Mary’s sons. Just a snapshot of village life, really. So here is the first marriage certificate: James 1826 Stbg, my gg-grandfather and Mary Andrews of Eggington, married at a very young age, by banns, in Stanbridge Church on July 26, 1847. You can see their entry in the banns register, which, in spite of its age, is still being added to in the “marriage season” even in the 21st Century. In the 1851 census we can see Mary and James Tearle in Stanbridge with their first child, Levi, just 8m old. They are living right next door to Joseph 1798 Stbg and Maria nee Millings of Soulbury. One day, I must track the spread of Methodism amongst the Tearles. We know from the Dunstable Methodist circuit records that Joseph and Maria were Methodists and we know that Phoebe nee Capp was also a staunch Methodist; how much did this influence James and Mary and therefore Levi? Levi is my great-grandfather who moved to Wing, set up a successful smithy there and was the superintendant of the Sunday School in the Primitive Methodist Chapel in Church St, now a private residence. Joseph and Maria are much older than James and Mary. Joseph 1798 Stbg is one of the grandsons of Joseph 1737 and Phoebe nee Capp. These are two parallel families living side by side in Stanbridge; Joseph 1798 grandson of Joseph 1737 and James g-grandson of John 1741, the brother of Joseph 1737. I know from living for 10yrs in a village of 100 houses, that these two families would have known exactly what their relationship was. 1861 = James 1827 Todd Mary 31 Levi 11 Sarah 8 Elizabeth 5 Isabella 3 in Stbg. Amos was b July 1861, so he missed the April census day. The grand-daughter belongs to Sarah, who goes on to marry George Blake 1857 of Stanbridge. This is where it starts getting complicated. James died in April 1887. I also have a wonderful photograph of the two of them, but it’s in New Zealand and I will have to wait until I visit there again before I can see it. In 1891, they are living in Tilsworth End, not far from the Hockliffe Bridleway, now called Kings Way. In the Hockliffe Bridleway are James 1819 Stbg and Hannah nee Phillips of Fleet Marston, Bucks. This James 1819 is the uncle of our James 1827 Tod, being the much younger brother of James’ father Thomas 1807 Stb. Both men are among the sons of Richard 1773 Stbg and Elizabeth nee Bodsworth. Mary would have known James’ uncle. 1841 Charles Shillingford 15 in Stbg, hence b1825. He was a worker on the farm of James and Sophia Frambleton (?) in Backlane, Stanbridge. This must have been renamed, because I am not familiar with the road. He is one of seven such workers and the next door farm is the one belonging to Daniel Ellingham 1776 Stbg. 1881 Charles Shillingford 1825 Stbg Catherine 64 in Stbg. Charles is living with his wife Catherine in Tilsworth Rd and he is a railway labourer. I know that Mary died in 1914 and I know that Levi visited her almost every weekend, travelling there by horse from Wing. It’s not too far, but the roads were a bit rough. It was probably incorporated into Levi’s weekly trip to Leighton Buzzard for supplies. I have walked from LB to Wing and it’s not very far at all. One nice sunny day soon, I’ll walk from LB to Stanbridge. So that brings me to 1901. Mary nee Andrews has married William 1832, her first husband’s brother. This is a portion of the 1901 census report for Stanbridge. The record clearly states that he is Married, 69, Retired Railway platelayer, and the word Pension is written in bold. The record also clearly states that Mary is Wife, 70, and has Superannuated alongside her name. This, without doubt is William 1832, of William and Catherine nee Fountain 1834 Eaton Bray. He is the brother of James 1827 Stbg, of whom Mary is the widow; he is also the brother of John 1829 Stbg “For 60 years the sexton of this parish.” The headstones of James and John stand side by side near the church, but there is no sign of William’s. There was a third marriage certificate to find, and when eventually I did, it was quite unusual. When I found this certificate, and it took a while, I wondered why they got married in Watford, and I speculated that there might be a bit of subterfuge involved. Mary was, after all, marrying her late husband’s brother; and if it wasn’t actually illegal, then it was frowned upon. However, if you consider the nature of William’s family – that they founded two Willesden families and at least one Watford family, then perhaps it wasn’t so difficult to comprehend. I noticed the witness: Henry Walker Simmonds. He married Ann Tearle in Stanbridge in 1864 and you can see that in the banns register. Ann was the sister of James 1827, and John the sexton – and William 1832. She was already Mary’s sister-in-law. In the 1891 Watford census, Ann has a “Nephew,” William aged 16 (b1875) a sawyer, living with her family. This is probably William and Catharine’s boy. I can’t find the address Mary says she was living at when she married; Ann and Henry were living at 44 Frarnley St, Watford, when the 1891 census was taken, but that didn’t mean they were still there when Mary was staying in Watford prior to her wedding. However, whatever the circumstances under which Mary and William were married, it was conducted in dignity with family and friends in attendance. The last sighting I have of Mary is a sad one, but tinged with relief. On her death certificate you can see that she has died at Levi’s home in Wing, with Levi at her side. The house in the middle is called the Ebenezer Cottage (you can see the name carved into the window sill) and Levi Tearle, my g-grandfather, lived here with his family while he built The Big House, as the family called it, which is the attached house on the left of the two cottages. 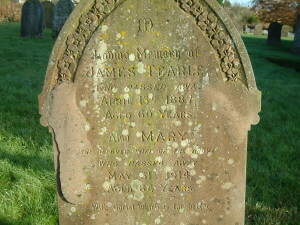 Headstone for James Tearle 1827 and Mary nee Andrews in Stanbridge Church graveyard. 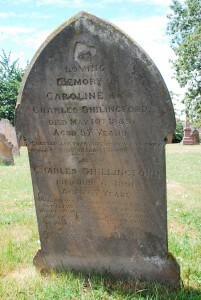 and Charles Shillingford is buried with Caroline. 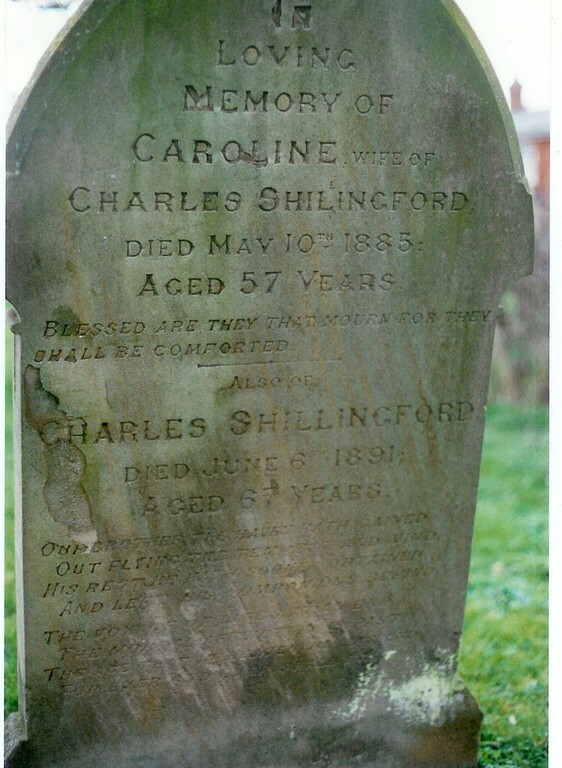 Headstone of Caroline and Charles Shillingford in Stanbridge Church. It’s easy for us to criticise Mary, but without someone to look after her, she had a very dismal future, stricken with poverty. Charles’ pension from the railways would have helped, and so would the railways pension that William would have provided. As couples, they would have kept each company as well. We know that Levi certainly did not hold it against his mother, because he gave her care with a room (at least) in the Ebenezeer cottage, and he was at her side when she died. I also have no doubt that he paid for the headstone for his parents. William 1832 of Stanbridge was a son of Thomas 1807 Stbg and Mary nee Garner. His grandparents were Richard 1773 and Elizabeth nee Bodsworth and his g-grandparents were John 1741 and Martha nee Archer. William, then is on the branch of John 1741. He married Catherine Fountain in 1856. Here he is in 1841, at home with his parents, his sister Emma and little brother John, 1840, who would go on to be the “Sexton of this parish for 60 years.”, as told by his headstone in the Stanbridge Church cemetery. William’s eldest brother (my gg-grandfather) James 1827 was already at work as a manservant in the household of James Goodeson, a farmer in Heath and Reach. The Tearles were not educated and many could not read or write. It is not unusual for people in the various censuses to have different birth dates because they could not keep an accurate track of their age. Couple this with the 1841 census enumerators who often rounded up or down people’s ages by as much as 5 years and you can see how William is 9 in 1841, but 12 in 1851. In 1871 he is a “Platelayer on the Railway” – does that mean he’s gone up in the world? In 1901 he is a “Retired Railway Platelayer,” but he has married a Mary 1831 of Eggington, who is described as Superannuated. This Mary is Mary nee Andrews 1830 of Eggington. On Mary’s page you can see this story from her viewpoint. 1901 = William 1832 Stbg Mary 1831 Egtn in Stbg. I’m not sure when he died, but I am looking for his death certificate. One small note you might like to make is that Catharine was often referred to as Kate. Thomas 1858 married Pamela Andrews of Eggington and founded a family of Willesden Tearles, working on the railways. Charles 1859 married Lizzie Gates in 1882 and founded a family in Wolverton, Northants, also working on the railways. Ellen 1864. I don’t think Ellen married. The last I saw of her was in the 1901 Edlesborough census, where she was working as a housekeeper in the household of Henry Vasey, a baker, of Leighton Rd. At the same time and in the same house, working as a Journeyman Baker, was Albert Tearle, 1874 EB, the son of William 1852 Edles and Ann nee Bird. Albert is the brother of Louis (Lewis) of the headstone in Edlesborough Church. Albert is descended from William 1749 (and Mary nee Prentice) while Ellen is descended from John 1741. This is another example of the Tearle network in operation. This is surely not a coincidence. They would have known their familial links and the fact that their distant grandfathers were brothers. Victorian women maintained these links by giving their children their own and their mother’s maiden names. Henry 1866 went to Higham Ferrers, Northants and married Ada Hale in 1889. In 1891 and 1901 he was working in a shoe factory. During the very first TearleMeet in 2006, Enid Horton and her daughter Lorinda took on the task of compiling a Tearle-only Stanbridge Banns Register. The result is below, and all of us are grateful for the legacy Enid and Lorinda have left us. It took a long time before I had a database comprehensive enough to fully annotate everyone in the register. It eventually happened in January 2009, and Rosemary Tearle of Auckland, NZ, worked out who the Elizabeth Tearle was who married George Tearle in 1831. You can see that the first entry is 1825 and the last entry was in 1923; almost a hundred years of documentation. The wonderful thing is, this book is still in use, in the Stanbridge Parish Church, 191 years after the register opened. Compiled by Ewart Tearle, July 2006 – thanks to Enid Horton and Lorinda. The Cat number, in the column on the left, refers to the number of the page on which the banns appears. Hence the banns of John Tearle and Elizabeth Mead are on page 3 of the Banns Register. George 1809, son of Richard 1778 and Mary nee Pestel. G-son of Joseph 1737 and Phoebe nee Capp. Elizabeth Tearle, 1810, of Stanbridge, dau of John Tearle 1770 and Mary nee Janes. G-dau of John 1741 and Martha nee Archer. George and Elizabeth were cousins. Abel 1810, son of William 1769 and Sarah nee Clarke. Joseph 1737. Joseph 1823, son of Richard 1778 and Mary nee Pestel. Joseph 1737. This has been entered on the wrong page by the vicar. James 1827, son of Thomas 1807 and Mary nee Garner. John 1741. Mary’s family is usually spelt Andrews, and they are from the neighbouring village of Eggington. Joseph 1823, son of Richard 1773 and Elizabeth nee Bodsworth. John 1741. Marriage cert date 25 Jan 1849. This is the correct record. John 1840, son of Thomas 1807 and Mary nee Garner. John 1741. This was Maria Bliss, not Harriet. George 1844, son of Thomas 1807 and Mary nee Garner. John 1741. There is also a 1780 Q1 marriage in Hendon. Levi 1850, son of James 1827 and Mary nee Andrews. My g-grandfather. John 1741. Sarah 1853, dau James 1827 and Mary nee Andrews. Sister of Levi, above, who was married 1874. John 1741.